During the past few weeks in between visits with researchers, grant application writing and submissions, collections-processing, artifact loan packing and paperwork, and art purchasing related work, I set out to read the entire archive of the Alaskan Society of Natural History & Ethnology meeting minutes. I had long wanted to review these notes. Spanning the time frame between October 24, 1887 and April 24, 1905 and detailing membership rolls, financials, facilities and physical plant issues, acquisitions, and important organizational milestones, they are in so many ways at the core of the Sheldon Jackson Museum’s institutional memory. 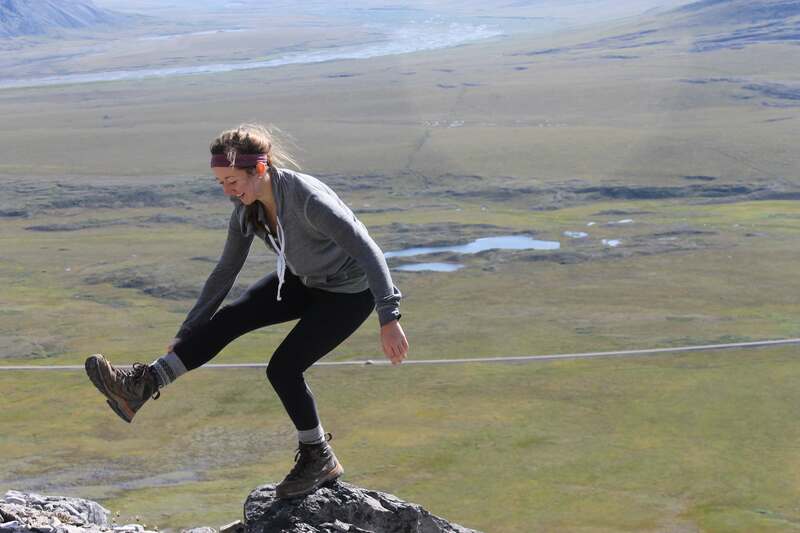 The exercise revealed a variety of differences and similarities between the present day Friends of the Sheldon Jackson Museum and the Alaskan Society of Natural History and Ethnology and the findings were at times, amusing. 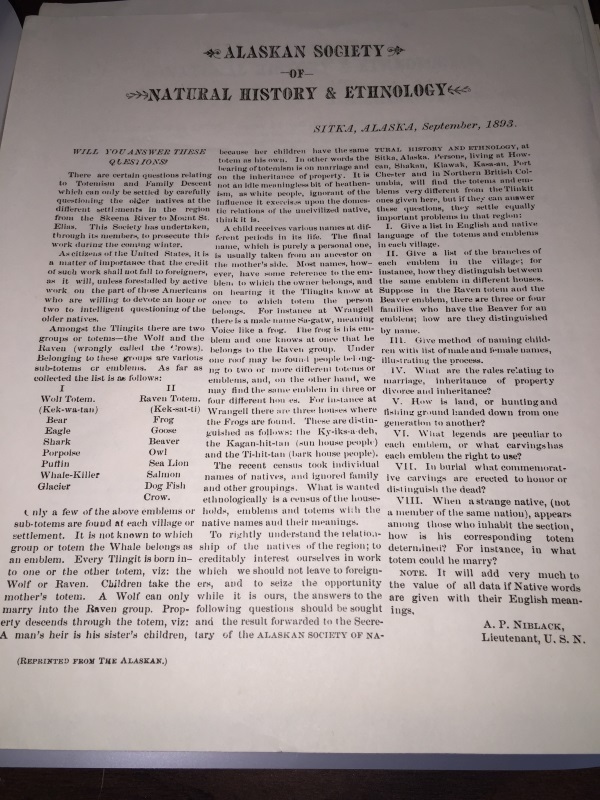 Thus, on October 24th, the Alaskan Society of Natural History and Ethnology was officially formed, elected Professor William A. Kelly Chairman and Miss Ida M. Rodgers Secretary, and unanimously approved the organization’s constitution, which stated, “1. The name of this society is the “Museum of Alaskan Natural History and Ethnology,” and the Society’s “purpose is to collect and preserve in connection with the Sitka Industrial Training School, specimens illustrative of the natural history and ethnology of Alaska and publications relating thereto.”, etc., etc. The constitution signatories included Maurice E. Kenealy, Susan S. Winans, Anna R. Kelsey, Gertrude B. Harding, Ida M. Rodgers, Rhoda A. Lee, Virginia M. Pakle, Mrs. Rose M. Baker, William Millmore, F.E. Frobese, A.E. Austin, Sheldon Jackson, D.D., and William A. Kelly. At that same meeting, corresponding members, at Dr. Sheldon Jackson’s motion, were elected including, U.S. Senator C.B. Farwell, D.C. Gillman, the President of Johns Hopkins University, Professor Wright of Oberlin College, Professor W.H. Libbey of Princeton University, Professor W.H. Dall of Washington, and several others residing in distant New York, N.Y., Evanston, Illinois, Portland, Oregon, San Francisco, California, and Milwaukee, Wisconsin. While the Friends of the Sheldon Jackson Museum have some generous supporters who live in other parts of the United States and world, these members do not generally submit letters or participate in organizational affairs in the same way that these 19th century individuals did. The Society was interested in ethnological material and Alaska Native culture like the present-day Friends, but as indicated by its name, had a tremendous interest in natural history and flora and fauna – an interest relatively absent in the modern Friends. Highlighting this interest was the Society’s division into committees including Taxidermy; Insects; Shells, Rocks and Fossils; Botany; Mineralogy; Capture of Fishes and Angling; Ornithology; Skeletons, Bones, and Horns. Today’s Friends have committees that focus on nuts and bolts and operational issues such as marketing, grants, and a newsletter, but nothing comparable in terms of subject matter focus. The Society strove to have an intellectual element with Vice President William Kelly initiating a motion for all members to give “a talk on something in the collection” – an artifact or a collection related topic at each and every meeting (see the October 1890 meeting minutes). While this was an admirable goal, and while membership did discuss Alaska-related themes and peoples of Alaska, I was surprised by the sometimes seemingly irrelevant subjects members focused on. Almost nothing, geographically or culturally, seemed out of bounds for discussion and talks included “An Article on the Country and People of Nicaragua”, “Cormorant Fishing in Japan”, “The Boxer Rebellion”, “The Aztecs and other Ancient Inhabitants of America”, “Tropical Africa”, and “Italian Cities.” While curiosity is still alive and well among present-day Friends and membership, unfortunately, as is the case with most boards of directors, no papers or scholarly articles are given during regular board meetings, the exception being during the annual Friends’ meeting when a guest lecturer is usually invited to Sitka to speak. Still, it is refreshing to know that there is much greater focus on the museum’s mission and on the collecting, studying, interpreting, and celebrating of Alaska Native fine art and material culture among the contemporary supporters of the museum. Among the most amusing findings I had was that the Society meetings frequently included demonstrations; not artist demonstrations – taxidermy demonstrations. The first official curator of the Society, Frederic E. Frobese had a profound love of taxidermy and he was notable for giving lengthy talks on certain animals or birds during meetings only to arrive at the next gathering with a gift for the Society – a stuffed version of whatever he had been expounding upon during the previous month’s assembly. Reading the minutes, it is almost as if you can prepare yourself for Frobese’s pending gift be it a stuffed crow or sea snake, Jake snipe, Bullfinch, Dipper bird, Hen hawk, or Mud gull. While every museum has members who can at times be a tad overly enthusiastic about a specific kind of object and may be prone to donating a significant amount of material reflecting their own interest in a particular subject, I am, no offense to Frobese, grateful the Friends have not, during my tenure, ever had to cope with an excitable, amateur taxidermist and a consequential abundance of stuffed king fishers, albatross, porpoise, flying fish, blue jays or other specimen. Perhaps the most fun part of reading the Society Minutes was reading a reference to a specific object given to the Society and being able to envision the specific object in my head on its shelf in collections storage or in its case in the gallery. 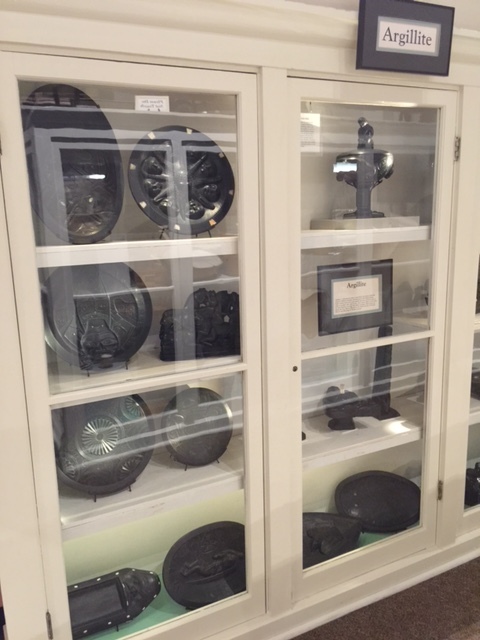 The first grouping of artifacts presented to the museum was a “very choice collection of black slate carvings from Queen Charlotte’s Island.” The majority of these twenty-two argillite carvings are on exhibit along the right hand side wall of the gallery. I read about a cane with a bone hand carved on the handle, the staff made of cedar, said to “be the work done by a Hydah Alaskan” which I identified as I.B.36, a cane with an elaborately carved finial in the shape of a hand. The piece, according to Northwest Coast scholar and carver, Steve Brown, may have been done by Charles Edenshaw. I saw reference to a grappling iron or old Russian anchor, which may have been V.A.90, a piece I recently packed in preparation for shipment to headquarters in Juneau. There was mention of a point of a bomb used in whaling at Killisnoo presented by John M. Vanderbilt, V.C.2, which I also recently packed for transport. Also described was an elaborately carved cane made of bone, very visible in my mind upon reading the minutes. Although some of the topics discussed during Society meetings were a bit too off course and although some of the committees and incoming acquisitions today strike us as odd, there were some Society practices and notions that the contemporary Friends might do well to embrace. William Kelly’s proposal that members devote themselves to research and writing about one particular artifact or subset of the collection and present upon it at regular board meetings, for example, is a refreshing idea and one that would better connect supporters of the museum with its holdings and encourage scholarship and inquiry too often lost in the shuffle of papers and day to day logistics that board meetings so often entail. The Society in the late 19th century had great interest in expanding the museum’s collection. While today’s Friends raise funds to assist the museum in making acquisitions or in some cases, purchase auction house items based on the curator’s recommendation, there was an even stronger notion in the days of Sheldon Jackson that the Society should support “someone to go to Indian villages rarely visited….where fine specimens could be obtained…” What a wonderful opportunity it would be for the museum to have financial and logistical support to send a Friends’ designee or museum staff person to some of the more remote areas of Alaska to learn more about what artwork is available and then, if desired, purchase it. There are probably many talented artists whose work might be appropriate for the museum’s collection but whom are currently unknown to the Friends and museum staff. When I first took up this minutes reading exercise, I suspected a close reading would reveal a plethora of differences in the nature and function of the Friends of the Sheldon Jackson Museum and the Alaskan Society of Natural History and Ethnology, and that proved to be true, but I was also surprised, at times, how in some ways, so little had changed between the two entities that support the mission of the Museum. Both the Alaska Society of Natural History and Ethnology and the Friends of the Sheldon Jackson Museum still have some of the same preoccupations. Both groups, for example, discuss the importance of marketing the museum and having adequate pamphlets and photographs of the collections and/or interior in circulation and strategically placed throughout town and near arriving cruise ships so as to draw the maximum number of visitors. The very first week I picked up a copy of the minutes to read, we held a marketing meeting focused on reworking the current Sheldon Jackson Museum brochure. Both entities discuss income, membership dues, revenue streams, and the cost of admission. Both groups also occasionally have public discussion about events happening locally in town and partner with other groups. It seems in some ways, the more things change, the more they stay the same. Question: I was hoping you might have some insight with asbestos removal and collection items. 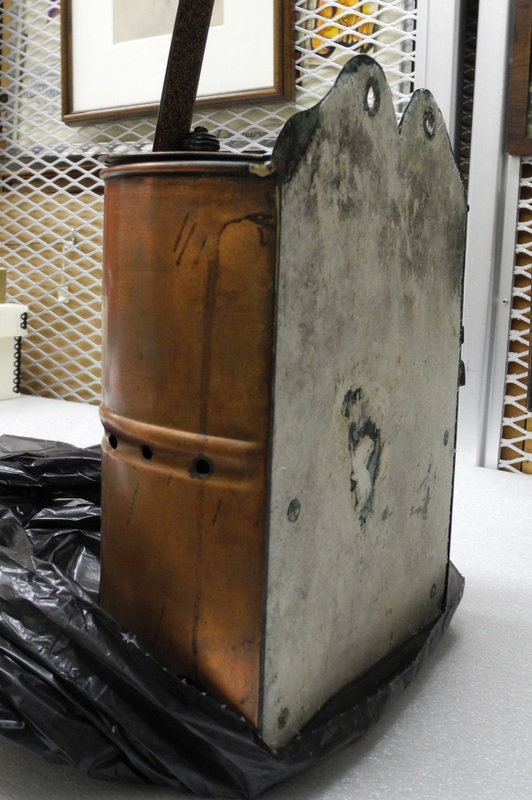 We have a copper wall mounted sterilizer that has a lining of asbestos on the back of the unit. We would like to see about getting the asbestos removed or possibly sealed? Do you have any suggestions or sources of conservators that do this type of work? ASM: This type of asbestos looks like long fibers and might be the mineral called serpentine asbestos. It is the least dangerous because of the long fibers. But that might be like saying the rattlesnake is the least dangerous of the vipers. Anyway, the best thing to do is get it tested so you know for sure what it is. The tests are not expensive and it if there is no one where you are that does it, you can have it done down south. In the mean time you should label it as a PACM (presumed asbestos containing material) with a warning label not to handle it. After you have determined exactly what it is, then it will be easier to decide what to do with it. Asbestos becomes a health hazard when you disturb it and it becomes airborne so that you can breathe it or it gets on something and you ingest it. It might be possible to seal whole artifact in a Plexi cube so that it won’t be disturbed. It you can’t seal it up in some fashion then you might have to explore having it mitigated. But that may end up ruining the artifact for any potential future display. The Friends of the Alaska State Libraries, Archives & Museum have announced the availability of the Ethel Montgomery Scholarship application. Applicants for the $2,000 scholarship must be enrolled in an Alaskan federally-recognized tribe and pursuing an undergraduate or graduate degree in museum studies. Applications must be completed and mailed by August 31. The Ethel Montgomery Scholarship Fund was established in the 1990s to assist university-level Alaska Native students majoring in museum studies. Ethel Montgomery was one of the first docents at the Alaska State Museum. She was adopted into the Kaagwaantann Wolf Clan and became a very active member of the Alaska Native Sisterhood. One of her dreams was to help young Alaska Natives become curators and directors of museums that celebrate their cultures. The combination of her love for museums and for the Native people, contributed to her establishment of this scholarship. Applications may be obtained by emailing Jackie Schoppert, Chair, Ethel Montgomery Scholarship Committee at kaageesaak@aol.com (907-321-5652) or Marjorie Menzi, marjoriemenzi@msn.com (907-723-9156). Your narrative and your budget should agree. Every expense in your budget should be mentioned in the narrative. Every expense in your narrative should be mentioned in your budget. Write Clearly. Your project plan should make sense to someone upon first reading, even if they are not a museum person. Do not add extraneous materials. Any attachments should be directly related to something in your narrative. Also, don’t make the reviewer plow through a lot of material looking for the relevant section you mentation in your narrative. Proof read, proof read, then have someone else proofread. Be especially careful when cutting and pasting to make sure that the flow of the text still makes sense. Make sure that when you “borrow” from a previous grant you make the appropriate changes to all the titles and labels. The narrative should answer questions not raise them. Try not to create questions in the reviewer’s mind or leave things in doubt. You obviously can’t anticipate confusion on the part of the reviewer but major aspects of the grant should be clear with no unanswered questions. Contractors or Temporary hires. If your grant is for a project that will use a contractor or a temporary hire, you need a letter of commitment from the contractor or a position description for the hire. Collections. If your project involves collections, describe those collections well, give numbers and types and examples. If your project includes some aspect of processing collections, you need to put it in some sort of time frame so the reviewer can determine if it is feasible in the time allotted ( i.e. 15 minutes per object/photo and there are 1000 objects/photos). Professional Assessments. The best way to get a grant is to have an outside professional evaluate your institution and work from their recommendations or priority list. A human being will read your grant! They are also reading many grants, not just yours. Keep your narrative as short as possible without leaving anything out. Use bullet items or other ways to relieve that “block of text” look that can tire a reader out. Make your points early and give the reviewer something to fall in love with. May 1, 2015, 2:00 – 3:30, EDT, with Susan Duhl. The George Washington University’s Distance Education Graduate Certificate Program in Museum Collections Management and Care will complete an UPDATE and REVISION this fall. New topics added to the program include digitization, sustainability, and collections care in archives. The graduate certificate consists of 4 classes in legal and ethical issues, collections management, and preventive conservation. The certificate is earned completely online and there is never a time that you are required to login for a class so you work when it suits you! The classes are taught by faculty with extensive experience at the Smithsonian Institution, the National Park Service, and the U.S. Department of State. There are also guest lectures from leaders in the field on topics such as fire protection and integrated pest management. We are accepting applications for the incoming fall class until August 1, 2015. Admission is on a rolling basis. 1. 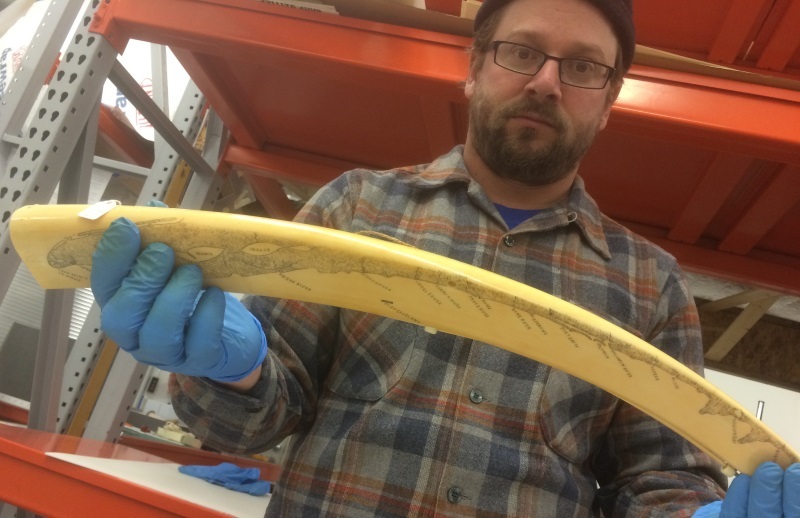 You started in the fall as the new registrar for the Alaska State Museums, what has it been like so far? Do you remember that part at the end of Goonies—the real ending not the one with the Octopus—when Sloth and Chunk swing to the rescue of Mikey and the other Goonies? Well, it isn’t like that at all. The last six months or so have been the highlight of my museum career. The pace and the professionalism of the SLAM project combine into an experience unlike any I have had before. 2. What is your background, how did you get into museum work? The first time the thought of working in a museum crossed my mind was on a road trip across Montana and South Dakota with my Dad. I was 11 or 12 maybe 13 years old. It was summer. He is an avid reader of non-fiction and American History in particular. On that trip instead of listening to the radio he just told me about the book he was reading and I just kept asking him questions about the story. I haven’t a clue what book it was—or perhaps I remember it wrong and he just knew. But the story was about the Battle of the Little Bighorn. I think my Dad might have grown tired of me asking questions because we eventually stopped outside of Hardin, Montana at Little Bighorn Battlefield National Monument—it might have still been called Custer Battlefield National Monument. We spent the afternoon touring the site and the visitor center. The power of the objects recovered from the battlefield coupled with the landscape which preserved the scene had a huge impact on me. I remember leaving thinking and I might have even said aloud that I wanted to work in place like that—a place with a palpable and powerful connection to important events and people who shaped our history. Since that experience I have sought out an intimate relationship with the stuff and stories of history; museum work satisfies these desires. 3. 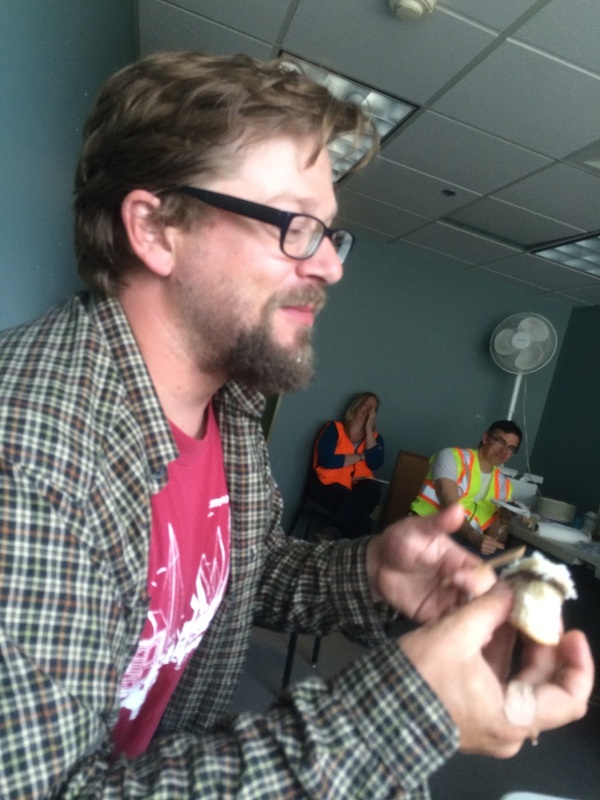 Your last job was at the Tongass Historical Museum, but that was not the first time you worked in Alaska. Tell us more about your other connections to Alaska. I first got interested in Alaska history while working at first as an intern and then a contractor for the National Park Service at the San Francisco Maritime National Historical Park. While there I help research, build, and install a new permanent exhibit aboard the historic sailing vessel, Balclutha. Though built to haul grain from California to Europe and the East Coast of the USA, she eventual was purchased by the Alaska Packers Association—who changed her name to the Star of Alaska. At about that same time I got a phone call from a friend in Tacoma. He was putting together a volunteer work party to a remote lighthouse in Southeast. Without hesitation I signed on and soon found myself at Cape Decision Lighthouse at the southern end of Kuiu Island as volunteer for the Cape Decision Lighthouse Society. 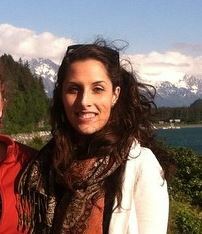 On that trip I also visited Sitka, Petersburg, Juneau, and Port Alexander. At each turn I found myself more and more interested in the history, forest, waterways, and lifestyle of Southeast Alaska. It took me a while to find the right reason and an opportunity to relocate to Southeast and feel grateful and lucky to have spent my first year up here at the Ketchikan Museums. 4. You also worked at the Center for Wooden boats, what was that like? In all honesty, working for The Center for Wooden Boats was fantastic and stressful—like I imagine working for most “bootstrap” non-profits is. And just like owning a wood boat, the two best days of my life were when I went to work for CWB and the day I walked away. I do miss sailing during my lunch break though. 5. Speaking of boats, didn’t you used to live on a boat and aren’t you somewhat of a maritime historian? Do you have an undying love of the sea? Who is your favorite nautical figure (fictitious or real)? I have lived on several boats. Before leaving Seattle for Ketchikan I lived aboard near the Ballard Locks and commuted to work at South Lake Union via a 14 foot lapstrake inboard launch with a 6 hp air-cooled Briggs and Straton motor. It was slower than driving; louder than riding my bike; about the same time as taking the bus, but infinitely more interesting and pleasant than all of those. No. I’d characterize my feelings for the sea as alternating between a healthy respect, distracting fascination, and periodic fear. Wolf Larsen from The Sea Wolf by Jack London, maybe? My favorite story about the sea and cheese is Open Boat by Stephen Crane; it contains everything a person needs to know about duty, loyalty, and how to row an overloaded boat in heavy seas. 6. Back to the land, what is your favorite part of museum work? My favorite part of museum work is touching beautiful, powerful, terrible, remarkable, awesome stuff. Actually my favorite thing is to give—well-ordered and small—tours of collection storage areas. For a lot of people it is a real epiphany to see and understand for the first time all the behind-the-scenes work that is part of every museum. 7. What do you think is the most challenging part of your job? The main purpose of my job is to keep track of where over 30,000 objects are at all times. That is the easy part. The hard—and challengingly fun—part of my job is to bring balance to collection. In my mind this is the sacred duty of the Registrar to hear, understand, and balance the oft’ competing requirements and desires of curators, designers, researchers, conservators, and other stakeholders for the maximum benefit—or least risk—to the collections. 8. The Alaska State Museum in Juneau is working full blast on getting the exhibits ready for the opening of the SLAM building in May of 2016, what is your role in getting this project done? The term “Vault King” has been used recently. 9. What piece of advice would you give someone just starting out in their museum career if they want to eventually get a job as a registrar? Getting a degree or certificate seems to be the norm these days for entering museum practice, but I don’t think it necessarily has to be. While I learned tons in my course work during graduate school I learned the most by having a variety of hands on experiences in very different types of museums. This might be hard to do in most places in Alaska. I found my first steady museum employment as a Museum Technician with the National Park Service. To this day I constantly rely on the training and best practices I learned during that time. NPS sets the standards for many museum practices or at least provide free resource and training materials. My advice to anyone looking to find work in the Collections Management field is to get some exposure to those NPS practices. 10. Tell us something that people would find surprising about you? I write poetry addressed to animals. Question: We have an old Uncle Sam costume in our collection that people remember fondly from seeing it in the annual 4th of July parade in days past. Since this coming year marks the 100th anniversary of the founding of our city, a request has come in for someone to wear it in this year’s parade so I need to know where to purchase archival underwear for the model to wear underneath to keep it cootie free. ASM: You can purchase archival underwear here: (tyvek undies) however cooties are the least of your worries. The greatest danger to the costume will come from normal wear and tear of putting it on and walking around in it. Not to mention the potential for rain or bird droppings or any a number of things that can happen to it out-of-doors. Archival underwear would not create a magical force field of protection for the garment. In the museum world we are always trying to balance preservation and access. It is sometimes useful to think of them as opposite ends of a spectrum and mutually exclusive. To get more access you have to give up some preservation and to gain on the preservation side you need to give up some access. Total preservation would require zero access. We also have to throw factors like museums mission and public engagement into the mix. Zero access means zero public engagement which will not help drive the mission of the museum. How much access is a matter of museum judgment. The normal exhibit environment can take its toll on artifact if we are not careful about things such as the amount of light, the climate control, integrated pest management, dust and pollutants, human interactions etc. but when objects leave the museum for some sort of use-type of access then we are getting into the “consumptive use” territory. Consumptive use is a big topic but in short it means that the object will eventually be consumed by the use it is put to because of wear and tear. Transportation museums face this difficult situation when they want to keep their antique cars running or their historic planes flying. They could eventually replace all the parts. Here is an example of consumptive use from a recent Hollywood movie that was made about the life of the fashion designer Yves Saint Laurent. Original museum objects worn for a movie, oh my! This creates all kinds of potential for damage. However, they did have representatives on hand with their “white gloves” and they fit the model to the clothes and not the other way around. So they were limiting access to increase the preservation of the objects. The article also talks about what the foundation conservator thought about the process as well. So they were very conscientious about it. I would like to believe that there were many discussions at the Foundation about preservation and access to the legacy of Mr. Saint Laurent. That they very carefully weighed the benefits of providing access to the possible risk damaging the clothes. That in the end they felt that the exposure of the collection in this way benefited the Foundation and furthered their mission. In the same way, you will need to decide whether to allow the Uncle Sam costume, or any other artifact in your museum for that matter, to be exposed to so many risks. You have to do the same cost benefit analysis. If the costume gets damaged it may be gone. You could also look for a more creative solution. What about making a working replica of the costume that could be used in the parade and then putting the real costume along with all the other relevant 100th anniversary objects on display during the month of July. Whoever, wears the replica could pass out flyers advertising the exhibit at the museum. This could turn the lemon of not being able to see the original in the parade, in the lemonade of increased public engagement with the museum. Lemons to Lemonade! And who doesn’t like lemonade on the 4th of July. 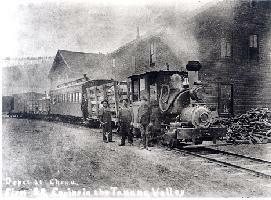 The Friends of the Tanana Valley Railroad obtained this grant to aid in construction of an “O” scale diorama of the Tanana Valley Railroad terminal as depicted in 1905 archival photos of the first steam train in the Alaska interior. 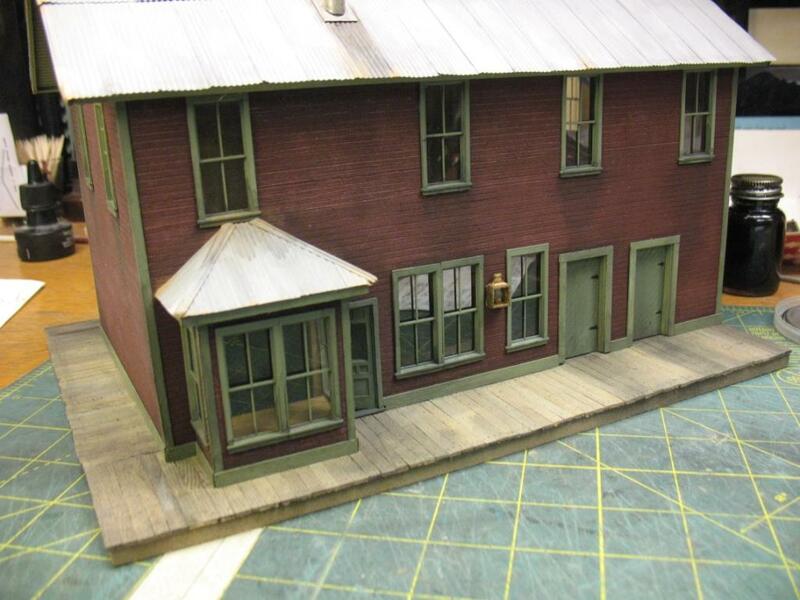 They commissioned the work to be done by a professional model builder of dioramas who has built several other early Fairbanks Gold Rush era scenic displays. Dave Lyons of Little Acres Group has agreed to take the existing model train of the engine and rail cars that were built and donated by other members to construct a scene of the original railroad terminal at the ghost town of Chena in 1905. The town was abandoned by 1917 and no remaining structures are extant at the old site where the first steam train in the interior of Alaska was brought in 1905. They have obtained many archival photographs and maps of the railroad terminal at Chena that show the original engine at the dockside warehouse and terminal. They have rebuilt the original 1899 engine that is depicted on the museum wall panels to full operation at Pioneer Park running on a 3/4 mile oval track circuit. They run the steam train on special events about six times a year to raise revenue for the museum and engine maintenance. Besides the actual train being on display inside the musem shop when not in use during these special run days, the next most attractive feature are the three model trains they have of the engine at different scales in our glass display case on the store floor with other antique train artifacts of the era. Egan introduces bill to name SLAM after Native historian. The National Endowment for the Humanities, Alaska Humanities Forum and the Anchorage Museum will be hosting a funding workshop for individuals and organizations interested in pursuing grant funding for humanities projects on Thursday April 2nd, from 1:00pm to 4:30pm at the Anchorage Museum auditorium. The workshop will include an overview of National Endowment for the Humanities programs and special initiatives presented by Peter Fristedt, followed by presentations by the Alaska Humanities Forum and the Anchorage Museum. You are also invited to join us for a tour of the NEH-funded Arctic Ambitions exhibit. A networking reception will follow from 4:30-6:00pm. This workshop is free, but you must register to attend. To register, visit: http://goo.gl/forms/O2PhgfHKMU. Space is limited, so we ask that those interested please register by March 27th, 2015. The Myers Center is now accepting applications from tribal museum professionals for its annual Native American Museum Studies Institute (NAMSI). Sponsored in collaboration with the California Indian Museum and Cultural Center and the Phoebe A. Hearst Museum of Anthropology, and supported with generous funding from the San Manuel Band of Mission Indians, NAMSI helps to develop the capacity of tribal community members to conserve and revitalize tribal cultural heritage, foster tribal representations and partnerships, and educate tribal and non-tribal communities through museum development exhibits. This year, NAMSI will be held from June 9-12 at UC Berkeley. Review of applications will begin on March 2, 2015. Read more about the Institute’s goals and workshops, and download an application here. A thousand trees have been planted in Nordmarka, a forest just outside Oslo, which will supply paper for a special anthology of books to be printed in one hundred years’ time. Between now and then, one writer every year will contribute a text, with the writings held in trust, unpublished, until 2114. A pretty crazy time-lapse video of reconstructing a marble statue that smashed when the pedestal collapsed. 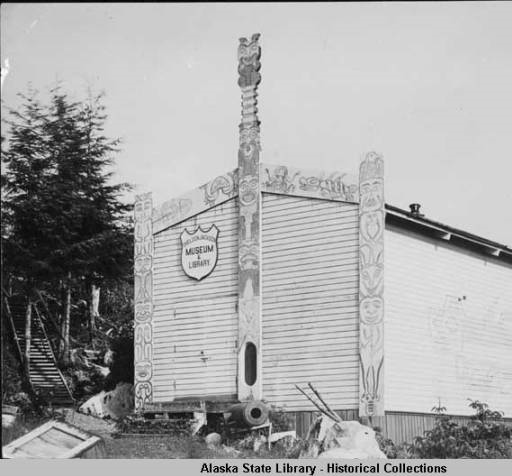 In 2014 the Alaska State Legislature passed a bill authorizing the Alaska State Museum to designate qualifying Alaska based institutions as Natural and Culture History Repositories. 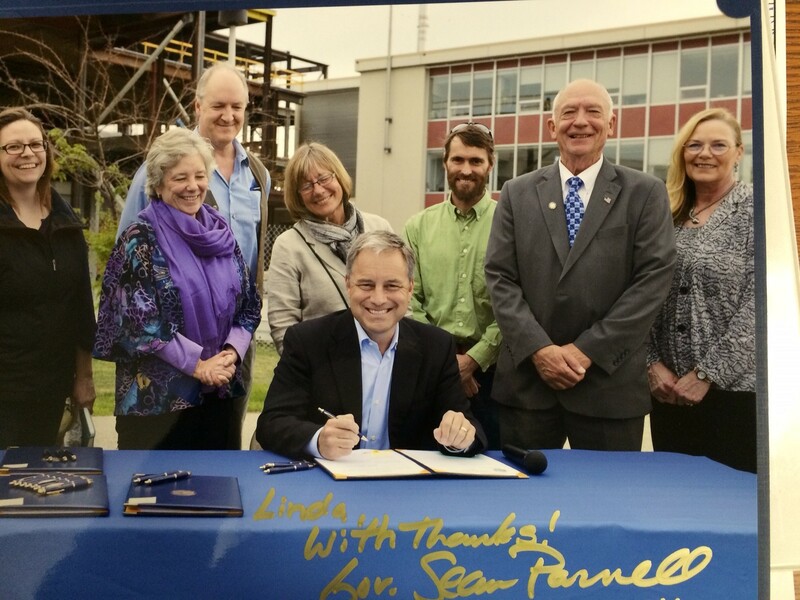 The legislation, House Bill 154, sponsored by Representative Steve Thompson of Fairbanks, authorizes the Alaska State Museum to develop and implement regulations that oversee the repository designation application process. Qualifying as Natural and Culture History Repositories, institutions will demonstrate professional levels of achievement useful in securing federal or private grants and other funds that require serious attention to collections care. Institutions will have the opportunity to compare their collections care practices with that of the national standards of best practices as defined by the American Alliance of Museums (AAM). 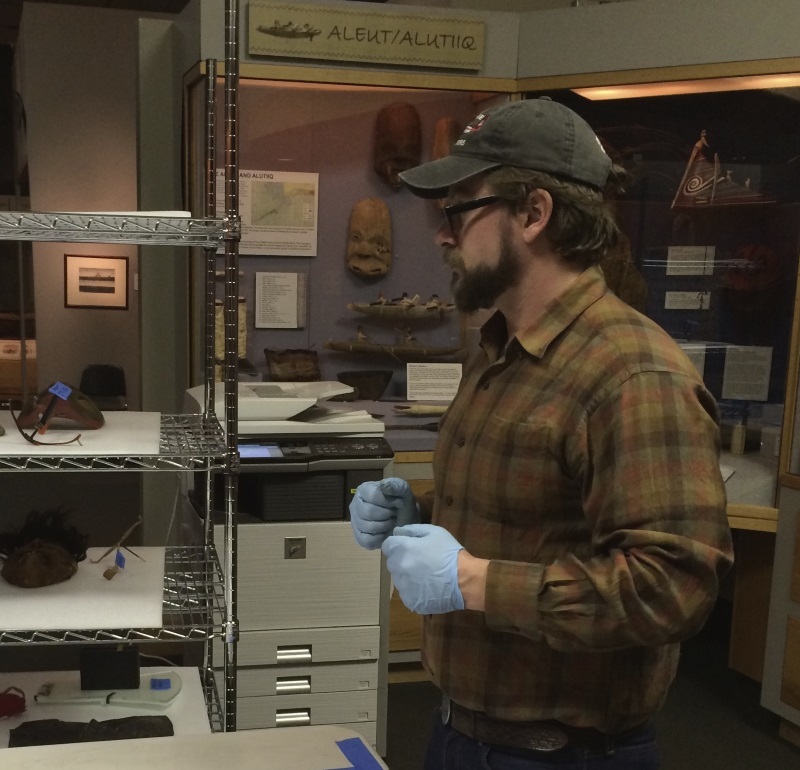 Seeking repository designation will be an opportunity for developing collections management priorities for museums and cultural centers that wish to work with the Alaska State Museum staff to evaluate and improve upon their standards of collections care. 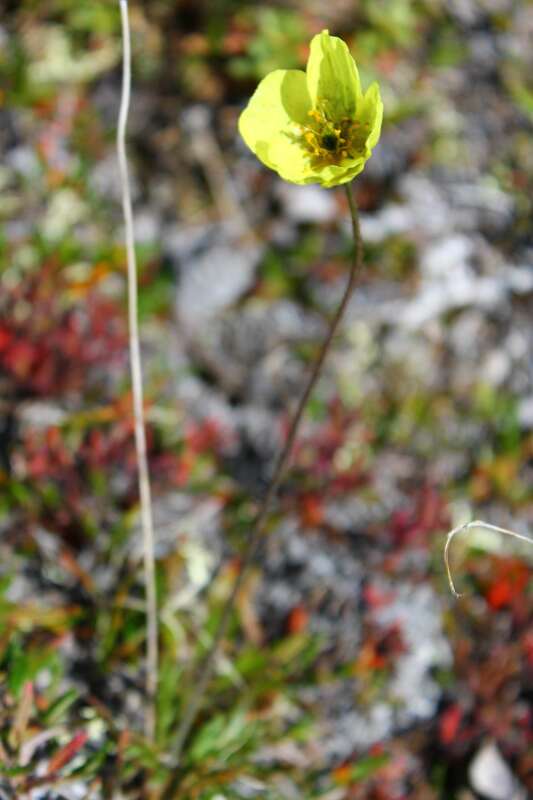 As authorized by the legislation, the Alaska State Museum will release the application for the annual opportunity for museums and cultural centers to apply for the designation of cultural and natural history repository on March 1, 2015. The first step involves an initial online questionnaire to be filled out by a designated museum official requesting consideration as a Natural and Culture History Repositories. The second step is working with the review committee to determine that all of the requirements set down by the law for repository designation are met. Please contact Scott Carrlee, Curator of Museum Services, for more information on the repository designation process and if how your institution can qualify. Question: A local visitor to our museum brought in some moccasins and wanted to know how to clean them. 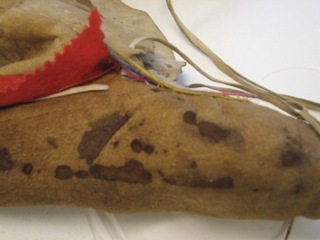 They appear to be mostly caribou hide and one of them has red stains on it. Is there any appropriate way to clean them? They are amazingly soft and pliable, and apart from the stains and damage to the horsehair decoration, appear to be in very good shape. Do you have any suggestions for him? ASM: The only appropriate way to clean them as a “Home remedy” is to carefully brush the surface with a soft brush while holding the nozzle of a vacuum cleaner nearby. This will probably do very little for the staining. 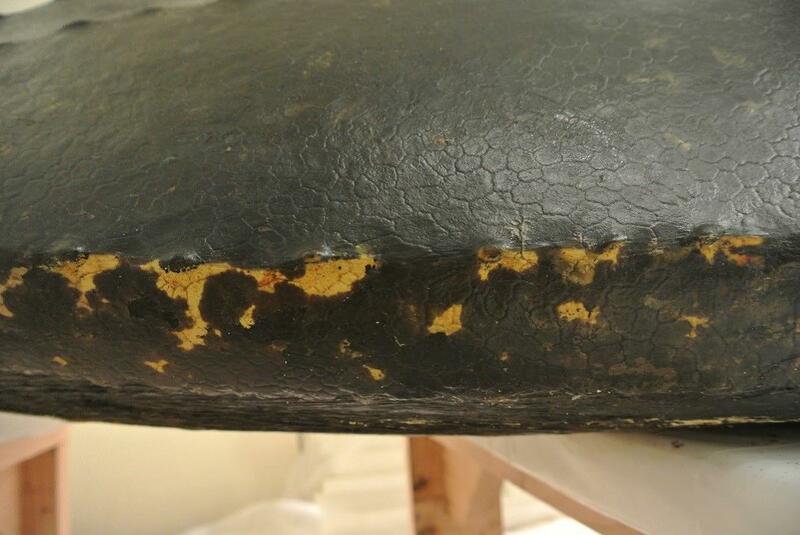 A conservator might be able to reduce the staining but it is unlikely to disappear completely or become supple again like the other parts. My advice would be to cherish them and take better care of them from now on. Better care would be to wrap them in acid-free tissue paper and store them in a Tupperware-type container. Keep them out of the light, keep dust off of them keep the insects away from them. Store them in a cool dry place. On Monday, February 2, President Obama released his budget proposal for fiscal year 2016, which begins the annual process of setting funding levels for federal agencies and programs. $372 million for the National Archives and Records Administration, a $7 million increase. In 2015, $100,000 in grants is available to museums and cultural centers in Alaska for collections management supplies and activities. 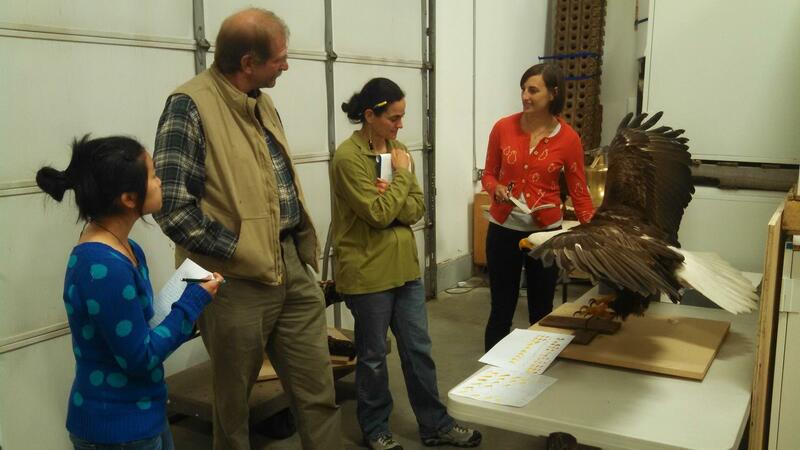 The goal is to build capacity for managing collections through professional expertise, training, and conservation materials and supplies. Applicants must be 501(c)(3) nonprofit, government, tribal entities or equivalent organizations that hold collections in the public trust, such as a museum or cultural center. Small, rural-based organizations are encouraged to apply. Preference will be given to projects that are collaborative or cooperative in nature. Emergency conservation projects will be given priority. Membership in Museums Alaska is encouraged but not required. Phase II of the Cordova Center Museum Design went well, but luckily the entire Cordova Center project is behind schedule so that gave the museum more time to carry out their GIA project. They utilized the GIA grant to upgrade their technology infrastructure including workstations, software purchases, improving our LAN and improving our in-house graphics capabilities. While the initial grant was focused on the purchase of an large format color printer, a Historical Society member and supporter generously donated nearly the same model they wished to purchase. 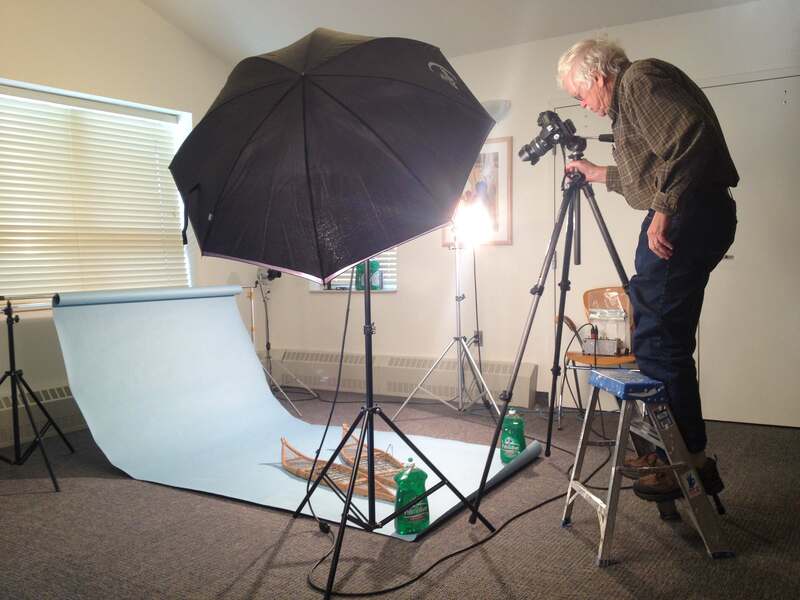 This donation allowed them to use the additional ‘surplus’ funds to purchase equipment to professionally photograph objects within their collection for inventory and record-keeping purposes as well as for their website and newsletter. They were also able to use some funds to purchase exhibit making materials and printing supplies. The materials enabled them to produce the graphic and other display signage for their new Jones Laundry exhibit. How a small organization with limited funds and two staff members developed a successful strategy to meet its preservation and access needs. The Hawaiian Historical Society is a small, non-profit membership organization founded in 1892 during the time of the Hawaiian Kingdom for the purpose of providing a library on the history of Hawai’i and Polynesia. Their primary goals are the preservation, care and access of their collections. This webinar will show you, in the context of a case study, how to make a long-range preservation plan using worksheets. See the steps the Hawaiian Historical Society took to identify and articulate their preservation and access needs, how they set priorities, and how they developed a long-range action plan for successfully addressing those needs. Finally, we will look at how the staff of two implemented their plan and what they have accomplished. There will be lots of handouts and practical suggestions to get you started using the worksheet method for better preservation planning in your own institutions. Featured Speaker: Sherelyn Ogden is the book and paper conservator at the Minnesota Historical Society. In addition, she has a private consultation and treatment practice for the preservation of library and archival materials. Previously she held the positions of Director of Field Services at the Midwest Art Conservation Center and Director of Book Conservation at the Northeast Document Conservation Center. She has more than thirty-five years of experience in the field as a practicing conservator, consultant and teacher and has written and edited dozens of professional publications. She is the author of Preservation Planning: Guidelines for Writing a Long-Range Plan. Sherelyn holds a BA from Bucknell University and an MA from the Graduate Library School of the University of Chicago. She is a Fellow of both the American Institute for Conservation of Historic and Artistic Works and the International Institute for Conservation of Historic and Artistic Works. Supported with generous funding from the San Manuel Band of Mission Indians. The training is tuition free to the participants. A $50 non-refundable fee will be used to provide lunch and materials. Participants will be responsible for their other meals, lodging, and travel expenses (see website for more details). Partial travel stipends are available in case of financial need. Review of applications will begin on March 2, 2015. Application form and complete application instructions can be downloaded from our website at crnai.berkeley.edu or obtained via fax or mail by calling 510-643-7237. For more information, call Christine Trost at 510-643-7237 or email namsiucb@gmail.com . Focus on Collections Care is a series of workshops for institutions with material-based collections. The Balboa Art Conservation Center welcomes all museum professionals, volunteers, students, and interested people to learn about basic preservation theory and best practices from professional conservators and other experts in the field. Our workshops combine solid, detailed theory with hands-on learning and practical ideas for improving collections care at your institution. Financial assistance of $110 is available to defray registration costs for one participant in each workshop. To be eligible, individuals must work for a nonprofit institution, with an operating budget of $500,000 or less, that has historical or cultural collections that are accessible to the public. Additional stipends are available to participants from tribal museums and institutions. What is the truth? When do we know it? This is why we have artifacts in museums. 52 Weird Museums across the US. Guess which one they picked in Alaska?! Speaking of Weird Museums…what does a teapot museum in china look like? Fran Ritchie is a graduate of the Buffalo State College Graduate Program in Art Conservation. 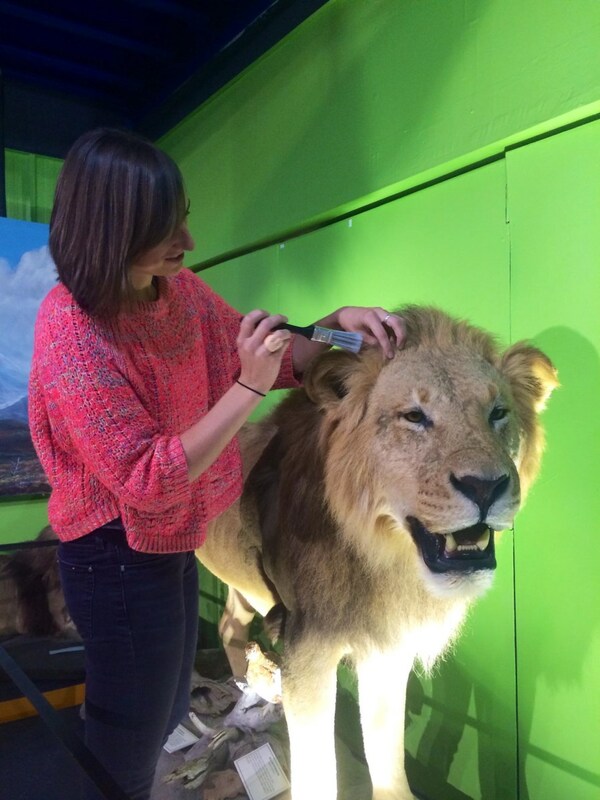 She is currently the Andrew W. Mellon Fellow in Objects Conservation at the Smithsonian National Museum of the American Indian in Washington, D.C. A love of taxidermy and natural science conservation was cultivated during previous experiences working for the American Museum of Natural History, Draper Museum of Natural History, and the Biltmore Estate. 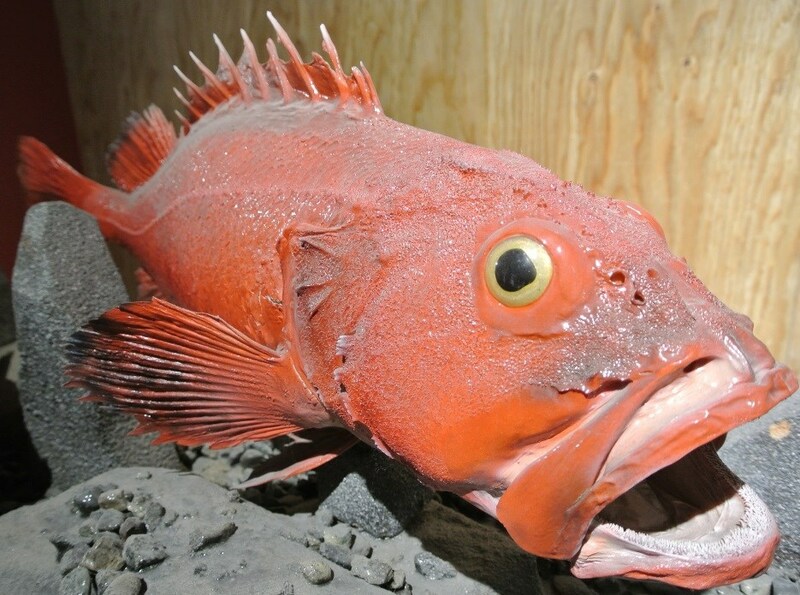 For historic taxidermy specimens in three museums in Alaska, this was a good summer. As a Natural History Conservator, I was able to travel to the state on a cooperative grant-funded project sponsored by the Museums Alaska Collections Management Fund to conserve specimens at participating museums—the Alaska State Museum in Juneau, the Cordova Historical Museum in Cordova, and the Alaska Museum of Science and Nature in Anchorage. Each museum provided a different challenge and experience, allowing for diverse methods of treatment and problem-solving. The Alaska State Museum is now closed to the public while a completely new facility is being built. Fortunately I visited the museum while it was still open and enjoyed the multi-level “eagle tree” exhibit–a replica of a single tree holding seven bald eagles of each life phase, a different eagle coming into view as you walk up or down a ramp. The new museum building will have a brighter and more visible eagle tree, meaning the bald eagles needed conservation in preparation for their new perch. Beginning the project the week of July 4th, a grouping of bald eagles seemed a fitting way to celebrate America’s independence. 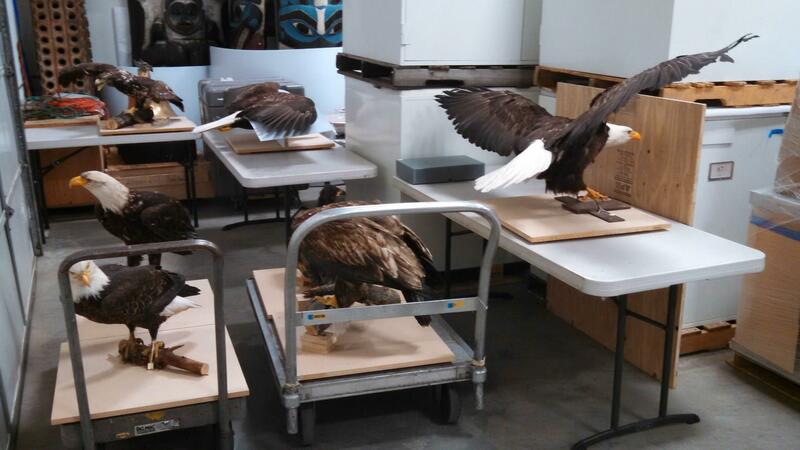 The group of bald eagles awaiting conservation treatment. -Each eagle was structurally sound, but layers of dirt and dust had accumulated from years of open display. 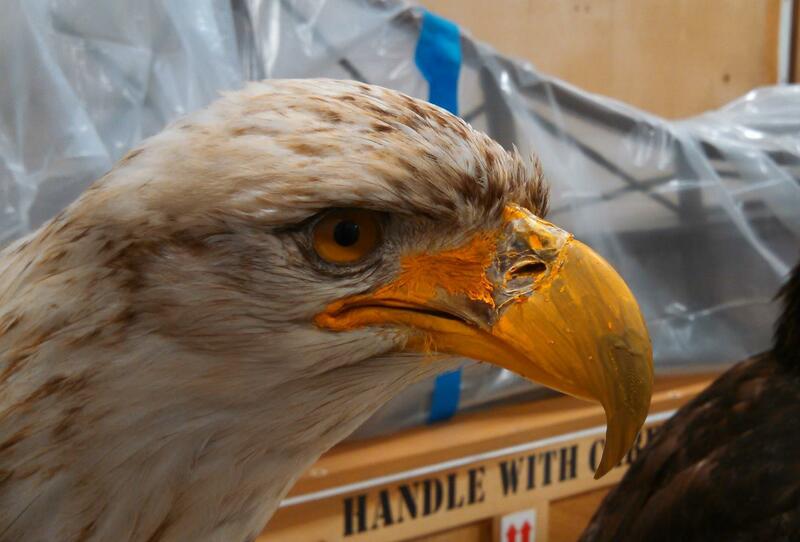 The eagles required careful vacuuming, cleaning of glass eyeballs, and preening of feather tips. -Since the birds will be reinstalled on a tree that is closer to the visitor, we needed to consider carefully their aesthetics to ensure they look as close to living specimens as possible. We consulted a local bald eagle expert to help with this phase. Phil Schempf is a biologist/ornithologist who has been studying the bald eagles in Juneau for many years. 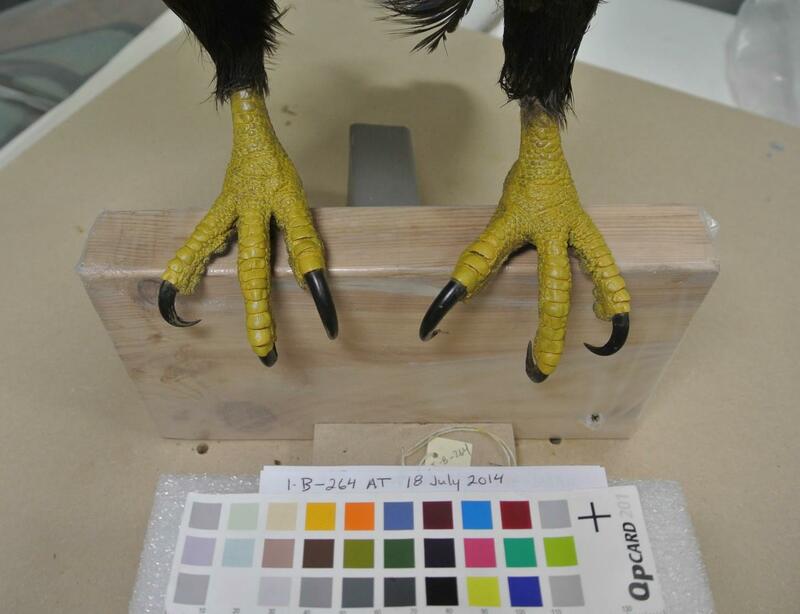 Besides regaling us with interesting eagle facts and stories, Phil also pointed out that the paint job on the beaks and feet of most of the birds was incorrect biologically. 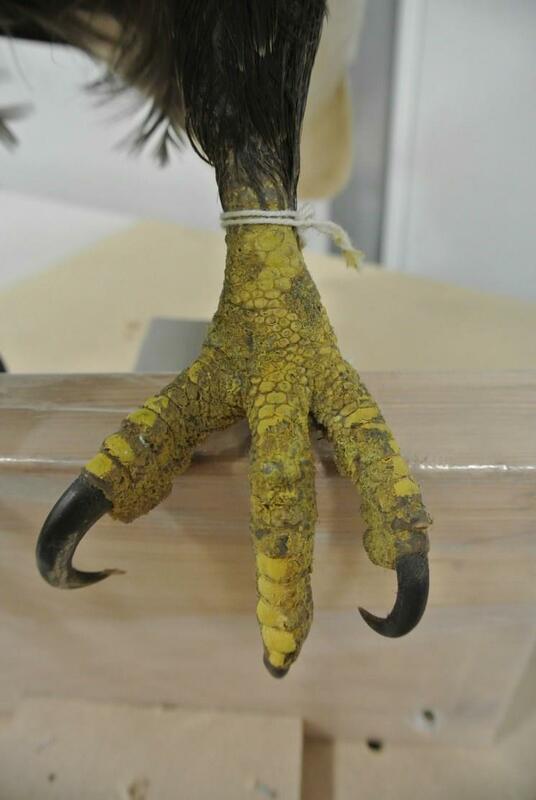 -Painting feet, beaks, and other areas that lose color after the animal has died is a very common practice in taxidermy. However, these birds looked more like they had gotten into a bag of Cheetos than like their living counterparts. 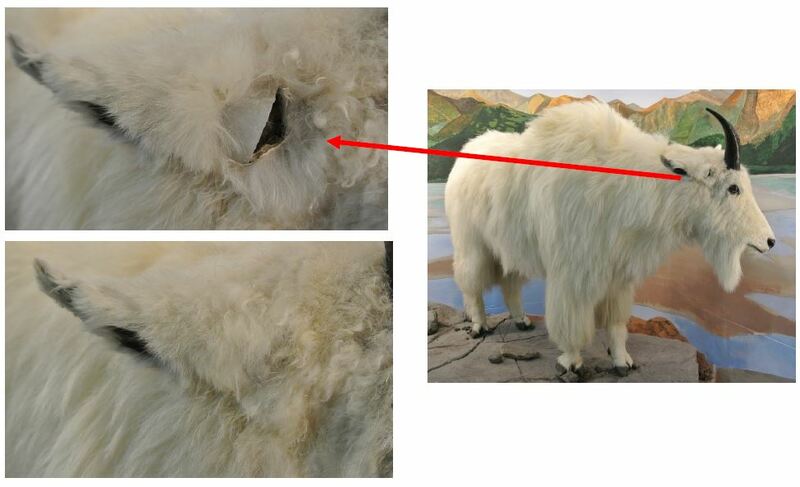 The taxidermist paint was removed and a new, more accurate coating of paint was applied. Flaking paint on the beak of one bird. The paint is also too orange towards the eyes, and too green at the tip. Discolored and flaking paint before treatment (left) and after treatment (right). 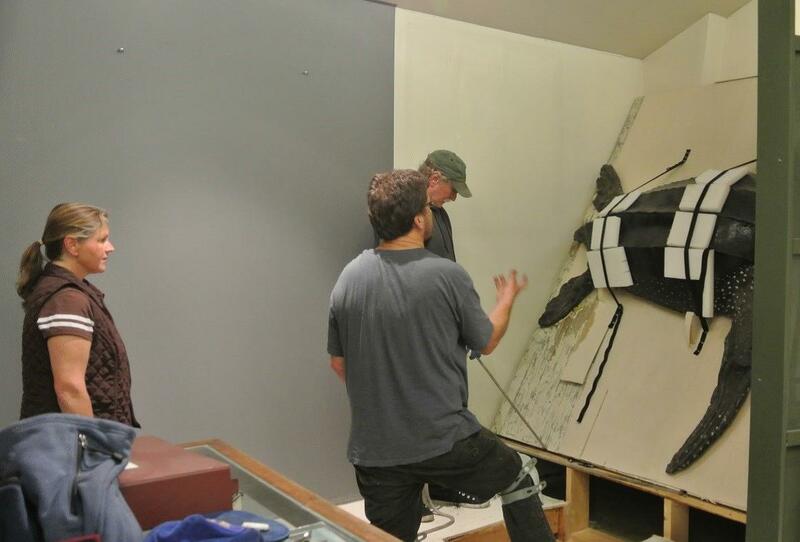 -Another dynamic upcoming display in the new museum will be a “Wonder Wall” full of Alaskan natural science specimens. I especially appreciate the new display because several previously unseen specimens will soon be on display for visitors. To prepare them for a public debut, many needed to be removed from old mounts and checked for accuracy with the help of the exhibits department. 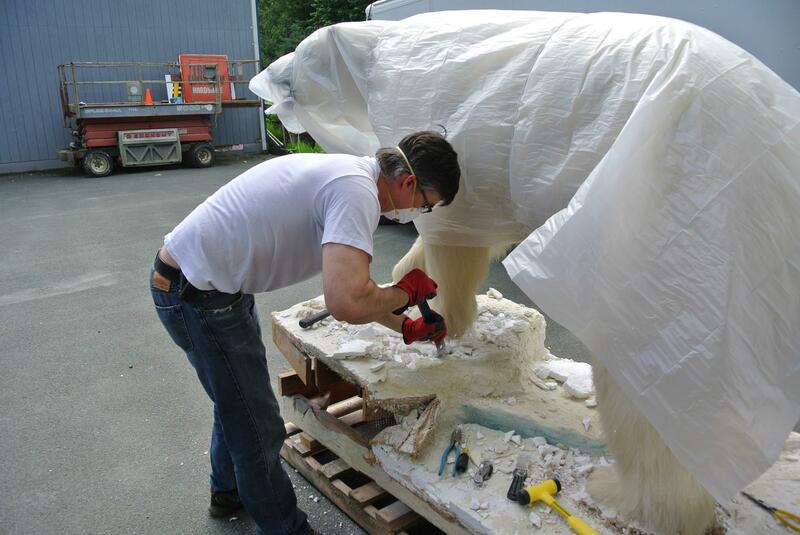 Aaron Elmore during the removal of a taxidermy polar bear specimen from its original base to pre-pare it for display on the Wonder Wall. The long hairs around the feet were embedded in a plaster matrix that had to be chiseled and crushed to release the hairs. -Over the course of just three weeks in Juneau, we were able to complete treatment of 3 of the 7 bald eagles (with all others in progress), remove a polar bear, and set up protocols for the treatment of several other specimens. Thank you to all staff at the Alaska State Museum, especially Conservator Ellen Carrlee, Exhibits Specialist Jackie Manning, Exhibits Specialist Aaron Elmore, museum volunteer Lisa Imamura, and visiting museum professional Bethany Buckingham. 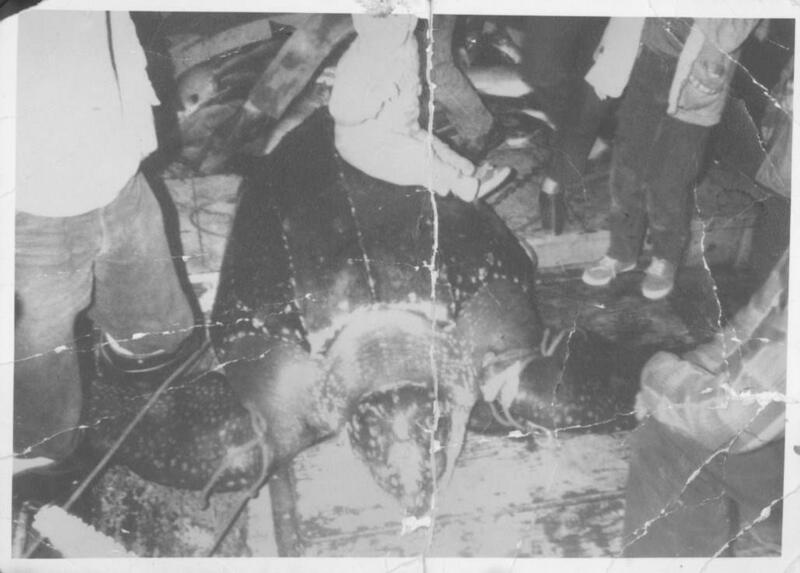 In 1963 an unexpected visitor to the frigid waters of Prince William Sound became entangled in a local fisherman’s net– a 600 pound leatherback sea turtle. The turtle was so unusual that it was preserved by a local taxidermist and given to the Cordova Historical Museum where it has been continually on display, garnering the love of local school children and town folk and who officially named him “Prince Willy.” The museum is gearing up to move into its new location in the soon-to-be completed Cordova Center, and the aging Prince Willy required four weeks’ worth of attention to prepare it for the move. Photograph of Prince Willy after it was caught and brought aboard the Pam L. The fisherman’s son, Dean Kramer, sits atop the turtle. 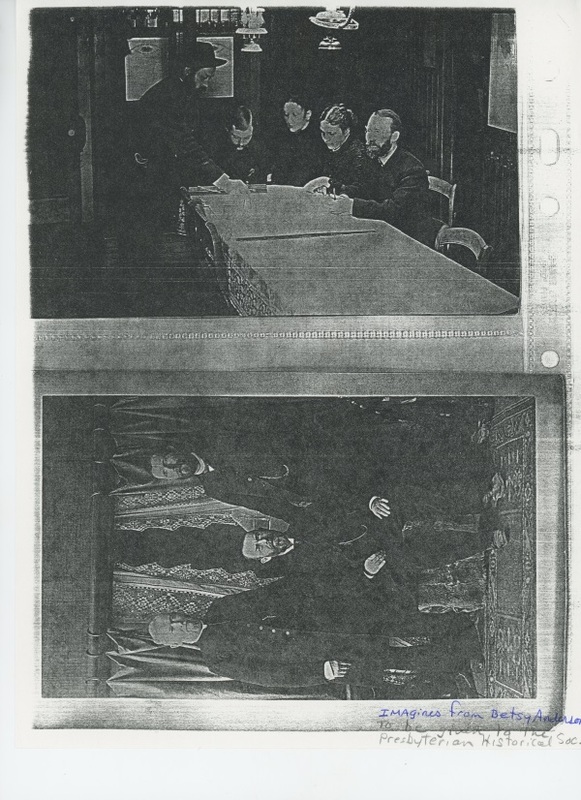 Kramer gave this photograph to the museum after hearing about the conservation project. -The turtle has a flipper span of nearly eight feet, and is over five feet long. Leatherbacks are the largest species of turtle and the only ones without a bony shell. Instead their shell, or carapace, is an oil-saturated matrix of skin, muscle, and small bones. Given the high amount of oil present in the animal, it is no surprise that they notoriously leak oil in perpetuity. 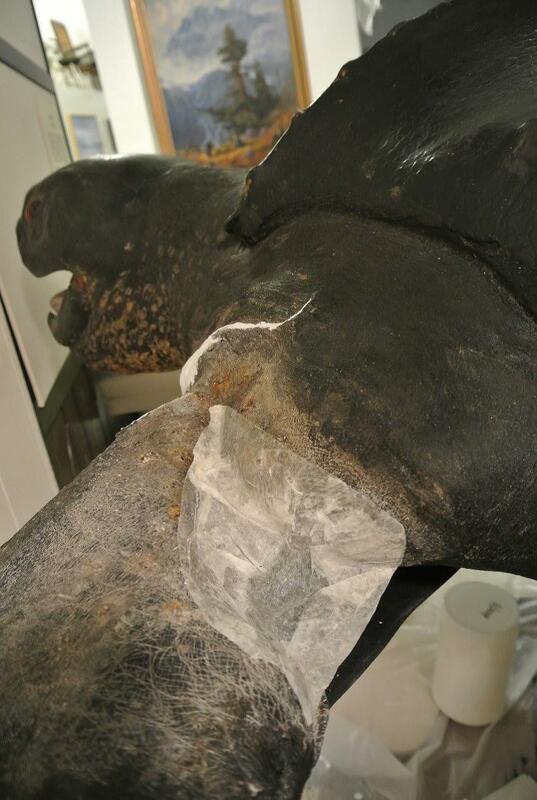 (I asked other natural history museums who confirmed that their leatherbacks were oozing oil). 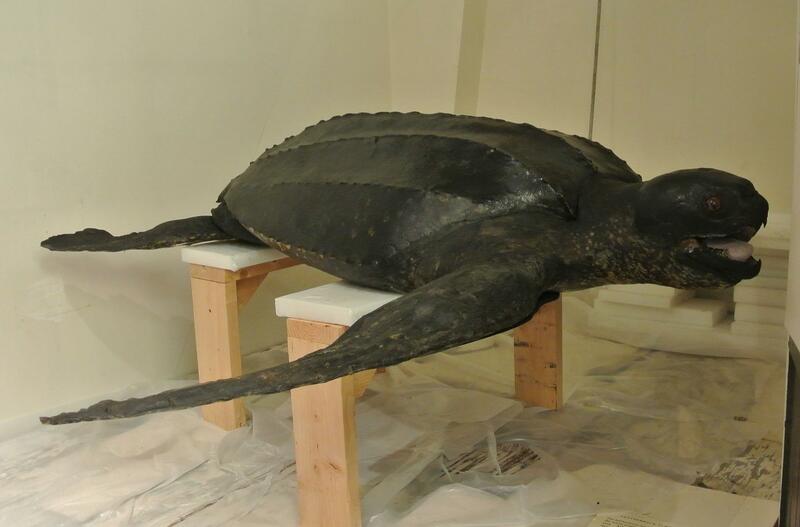 Left: The turtle on display in the museum before the conservation treatment. 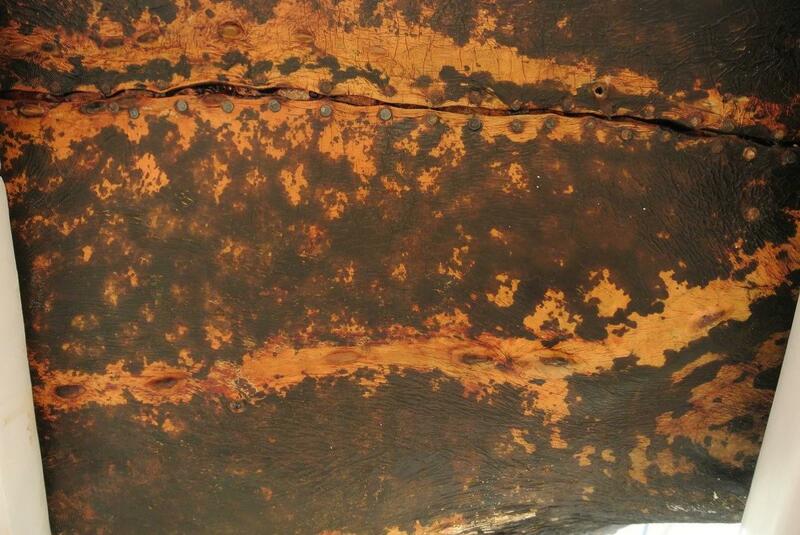 Note the large yellow-brown area of leaking oil around the bottom back flipper. Right : Museum Curator Denis Keogh (back to camera) helps direct community volunteers during the process to remove the turtle from the wall. -The oil was removed by carefully scraping it with a paint scraper, and then by using cotton pads dampened with ethanol. Left: Detail of the underside of the turtle before treatment. 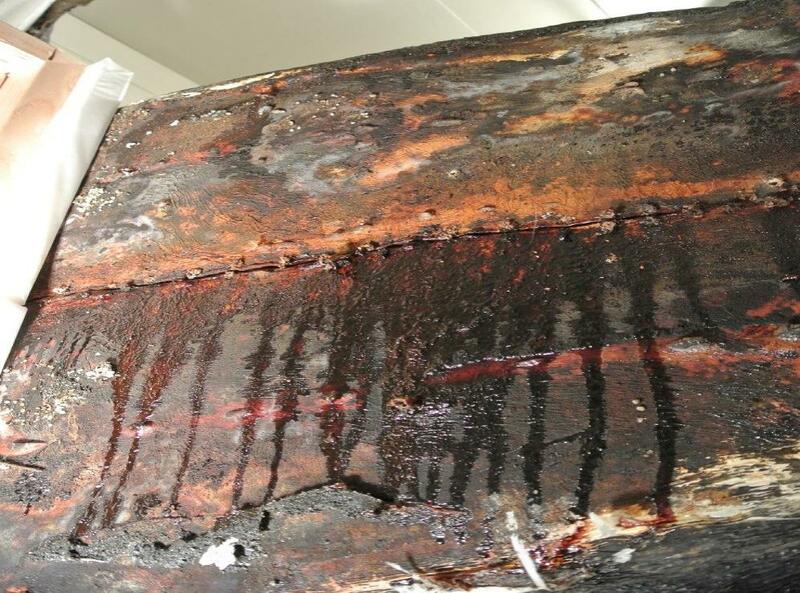 Note the dark, shiny oil dripping from the center seam in the skin. 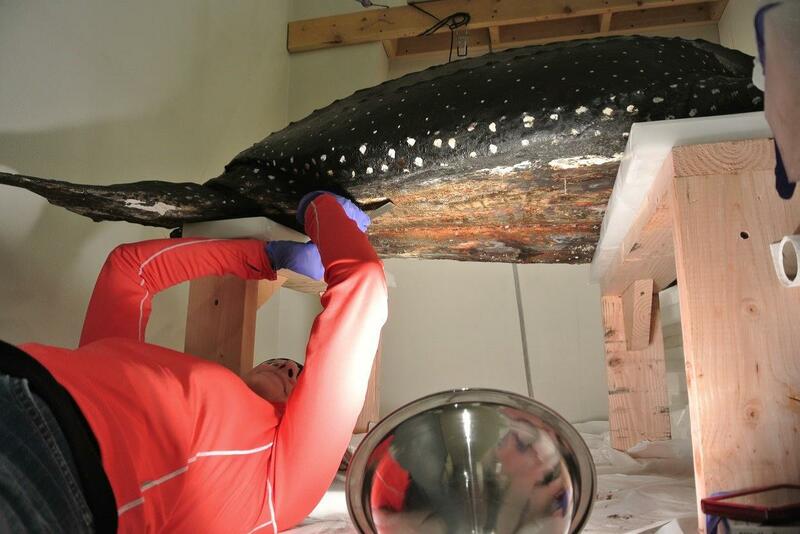 Right: Conservator Fran Ritchie scraping oil from the underside of the turtle. Detail of the underside of the turtle after treatment. -Prince Willy had other condition concerns in addition to the build-up of oil. A pie slice shape of flesh was missing from the turtle’s front left flipper (perhaps where it was caught in the net…or where flesh was taken for turtle soup). The taxidermist filled the gap with over a dozen nails, and then covered it with plaster and paint. The plaster was completely loose and falling off, which also revealed two large seams above the gap that were splitting into the skin. 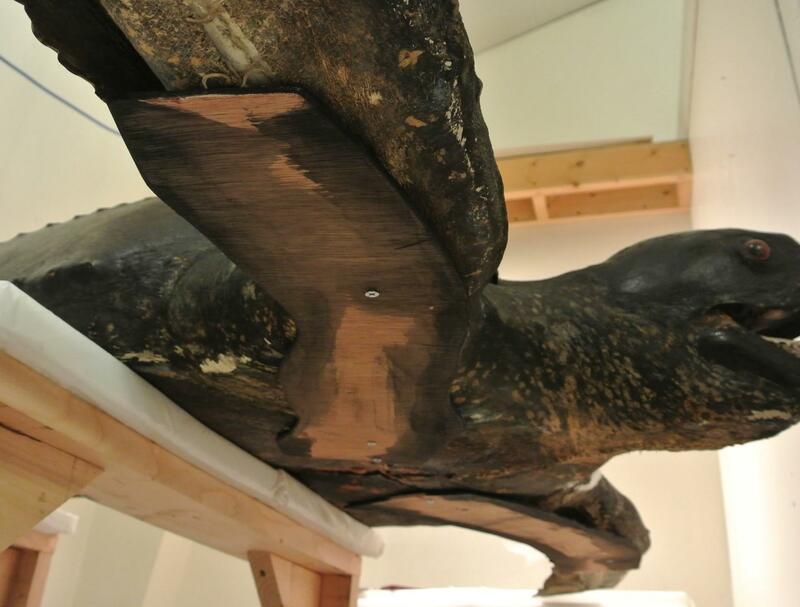 Because of the loss of flesh, the flipper was slightly loose and had been torqueing while on a slanted, vertical display, which may have caused the loosening plaster and tearing skin. Left: Top view of the front left flipper where the painted plaster is cracking and falling off (before treatment). Right: The same flipper after the plaster was removed. The red arrows point out the tearing seams in the skin, while the circle shows the nail-ridden gap in the flipper. -The plaster was removed, nails trimmed, and a piece of Japanese tissue paper used to cover the nails. Lightweight spackle was then applied over the tissue to build-up the surface and fill the gap. The white spackle was covered with more tissue to give the appearance of wrinkled skin, and then painted black. The splitting seams and tearing skin were repaired in the same manner. Left: The Japanese tissue paper covering the nails before adding a lightweight spackle fill. Right: The flipper after spackle fill and final painting. -Painted wooden boards were added to the front flippers to provide support and prevent further torqueing, especially when the turtle moves to its new location at the Cordova Center. 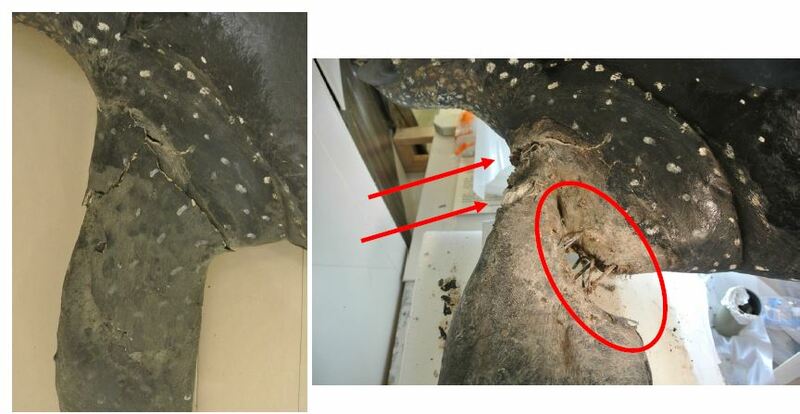 By drilling into the plaster that was exposed in the seam openings on the underside of the turtle, no new holes were added to the aging turtle skin. Underside of the front flippers before support boards were added. Note the gap in the seam of the skin exposing the internal plaster. 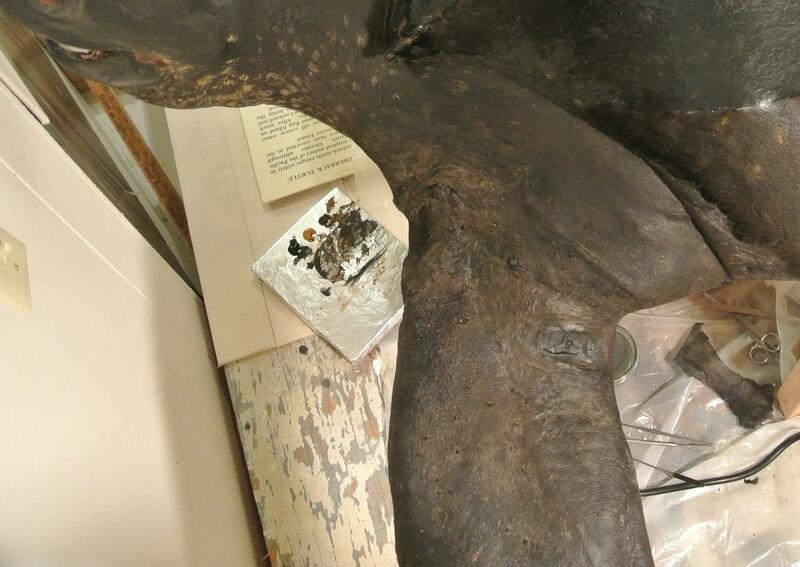 -The taxidermist applied a layer of black paint over the body, as well as white dots. 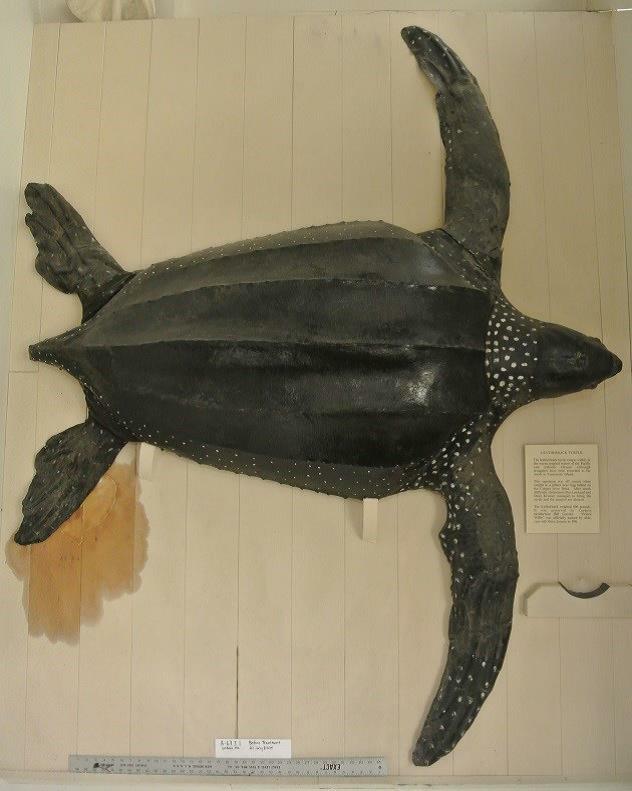 Living leatherbacks do have white dots, but the painted dots looked unnatural and very much like the work of a human, so the paint was removed from a majority of the specimen. 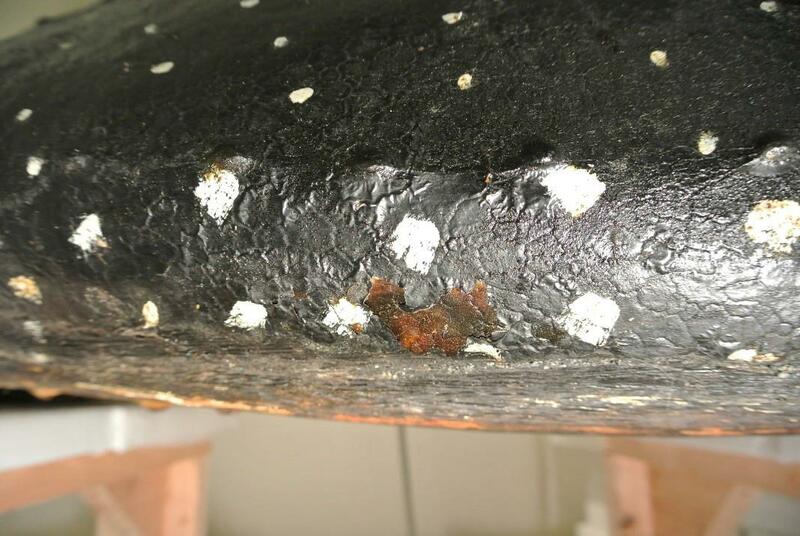 After discussions with museum staff and community members, it was decided that paint would not be re-applied. -The turtle does not look exactly like a living specimen without the white dots, but given its age and history, all of those consulted believed that the original skin looks best. Left: Side of the turtle before treatment. Note the black paint with white dots. The tan area in the middle is where paint has flaked off from the oil leaking between the original skin and paint layer. Right: The same area after treatment (after paint and oil removal). 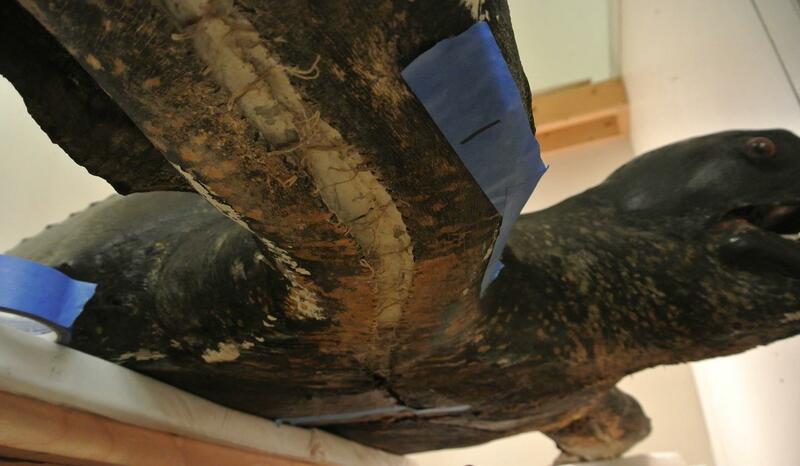 Prince Willy after conservation treatment, ready to move into the new museum facility. -A split in the skin on the front right flipper was repaired, as well as a chunk missing from the top of the head and several tears and old nail holes on the edges of the back flippers. Thanks to the museum staff, especially Curator Denis Keogh for his immense hands-on help, and to the Prince William Sound Science Center for solvents. The Alaska Museum of Science and Nature is the newest of all the museums visited during this project, having only been established in 1994, and opening its current building in 2005. Despite this short history, the Museum continues to make great strides in developing exhibitions and collections protocols, and renovating the building facility. To help continue this work, I performed a condition assessment of the collection storage and exhibit spaces, focusing on the collection as a whole with all materials in mind– from fossils, bones and taxidermy, to minerals and models. The condition assessment ranked condition concerns that the museum should prioritize for short- and long-term planning and stressed the practices that the museum is doing well and should continue. The museum can use this ranking when applying for funding as evidence of need. condition assessment. 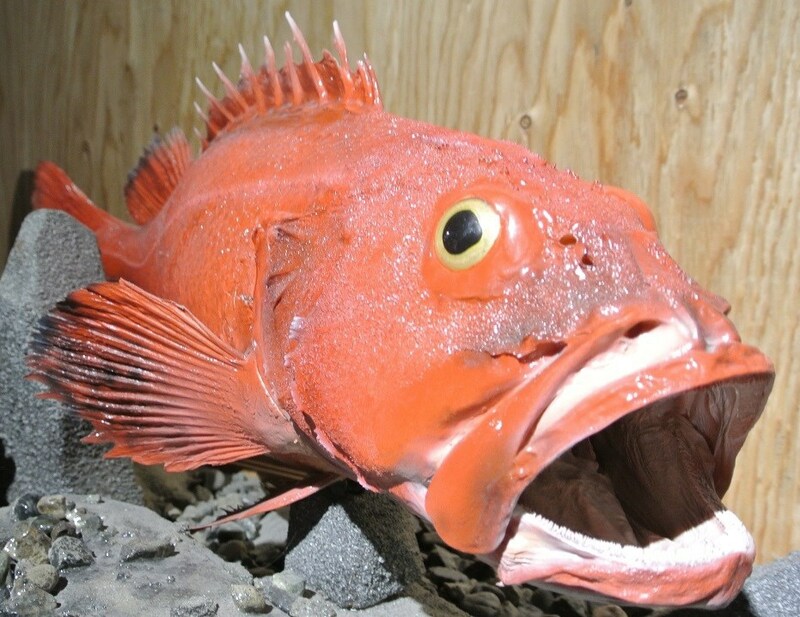 Right: The fish after treatment. 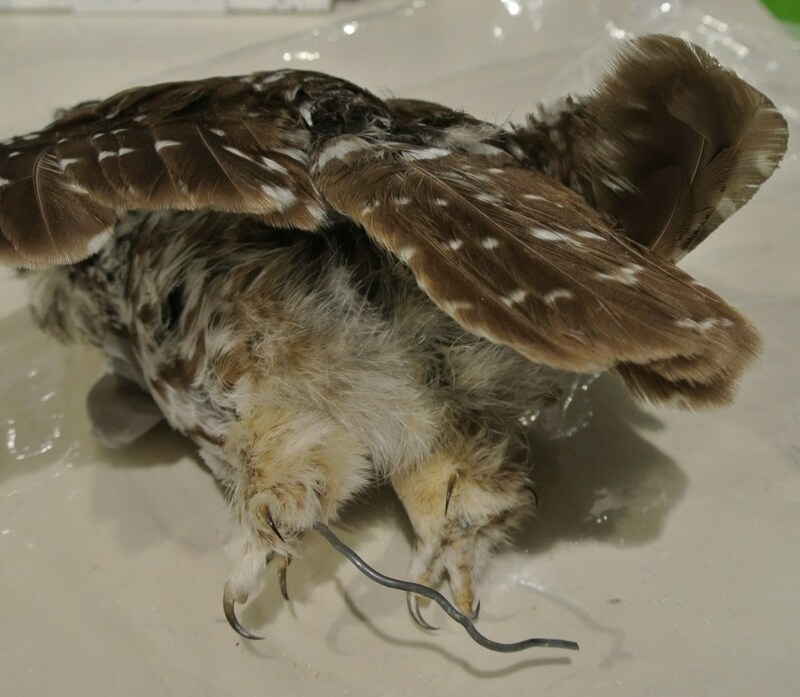 -Conservation treatment was carried out on seven specimens from the ornithology collection, most requiring tail and wing reattachment or stabilization, common ailments for birds because of their fragile, thin skin. reached and broken claws on both feet stabilized. 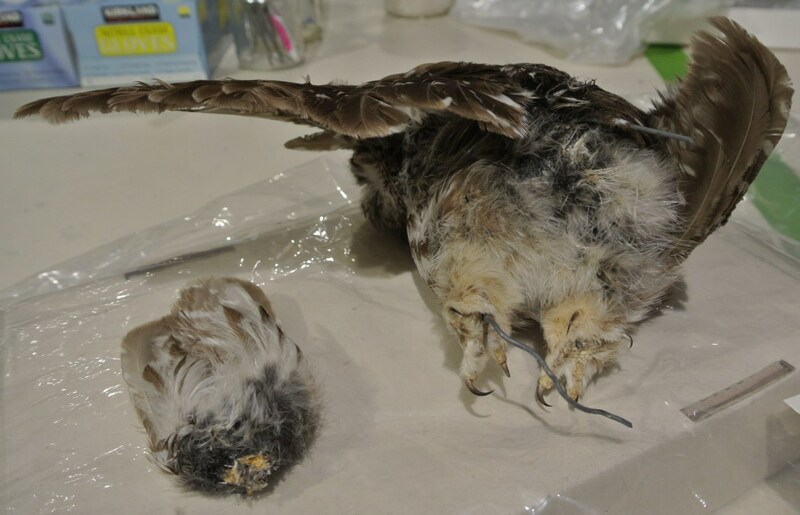 -Several taxidermy specimens and casts on display also received minimal conservation treatment to repair splits/tears, fill losses, and provide general surface cleaning maintenance. -To continue preservation protocols after the project ended, I was also able to teach permanent staff how to care for specimens. 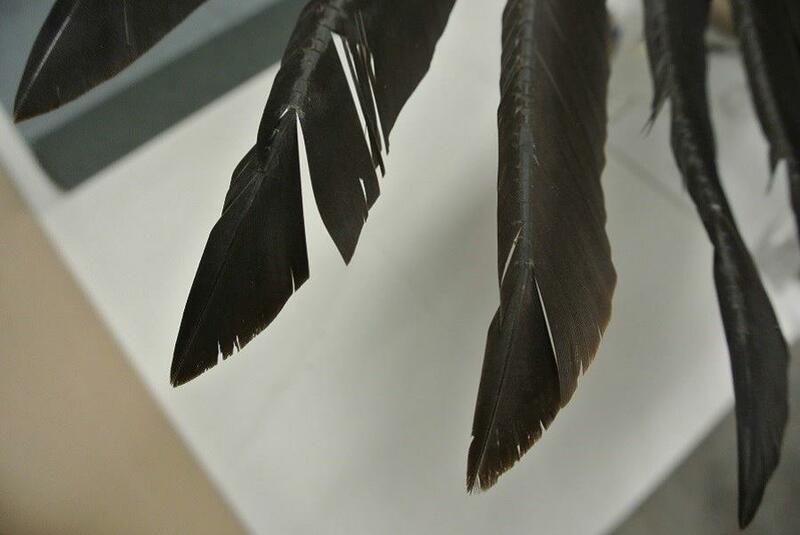 Together we cleaned an Alaskan rookery display after a tutorial on proper handling, vacuuming, and surface cleaning. -The two weeks went by quickly, but thanks to the friendly and willing staff, we were able to accomplish a lot throughout the museum. Thank you especially to Collections Manager Samantha Winer and Museum Manager Judy Bachicha for the rookery cleaning. 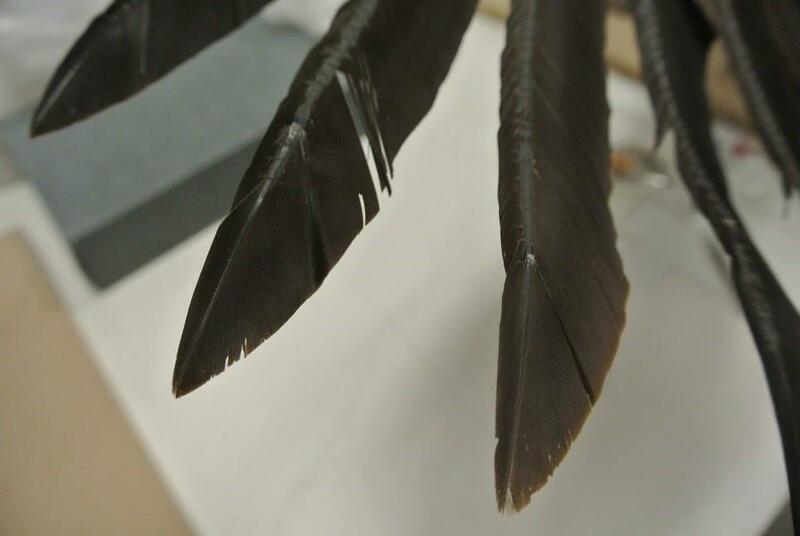 Natural history specimens are often ignored in institutions because of the uncertainty of how to care for them. It was with great pleasure and enthusiasm that I could work towards preserving these specimens, each of which has its own story and represents an invaluable place in our environment. What a treat that such work could be completed in a sublime landscape full of opportunities for eating wild salmon, hiking, sailing, and berry picking. This project could not have been done without the support of museum staff and community members, and a special thanks is due to Scott Carrlee, Curator of Museum Services for the Alaska State Museum; Cathy Sherman, Director of the Cordova Historical Museum; and Katch Bacheller, former Director of the Alaska Museum of Science and Nature; I extend my deep gratitude to each you for making this work possible. Question: I was asked by my supervisor, to find out the best way to remove super glue from a collection. All the research I have done points me towards using small amounts of acetone applied with a q-tip to remove the super glue. I know the super glue is on a collection that was donated and had been glued down to a fabric (there is also purple fibers on some-from whatever the artifact had been glued to), I believe the artifacts include wood, stone, and maybe some ivory and/or other bone. Any thoughts on this? ASM: As you may already know, super glue is a cyanoacrylate adhesive and once dry can be hard to remove. Here are two things to consider. First is that the bulk of the damage is done and there isn’t a big urgency to get it off from a deterioration standpoint, it is mainly an appearance thing…getting in the way of visual interpretation and study. Removing it incorrectly is a bigger risk than leaving it for a while. So you really need to answer the question “Why do you need to remove it?” If these objects are going on display or researchers can’t see what they need to, then there might a good reason to remove it. Next would be to determine the behavior of the adhesive, and if it really is super glue. I would suggest starting with a not-so special stone item…one that is robust and the adhesive is in an inconspicuous spot…something without a lot of interpretive value…and see what the adhesive is like. Sometimes adhesive can be picked from the surface with a scalpel or X-acto blade without leaving traces of itself behind. A tiny cotton swab with a bit of acetone could also be tested there to see what it does. One of the risks to removing adhesives is that many of them don’t fully solubilize (dissolve) in a solvent, they simply swell and get softer. That may make it possible to remove, but if it has penetrated into the pores of the artifacts, it swells in those pores and causes damage. Even worse it could strip off the surface when the gob of adhesive is pulled off. Staining from the adhesive or from the solvent you use is also a very real possibility. A conservator would consider this a conservation treatment and would be photographing a “before” shot of all those areas of adhesive on each item, and an “after” shot of the results. All the while, a conservator would be keeping a record of what solvents were used and what happened. 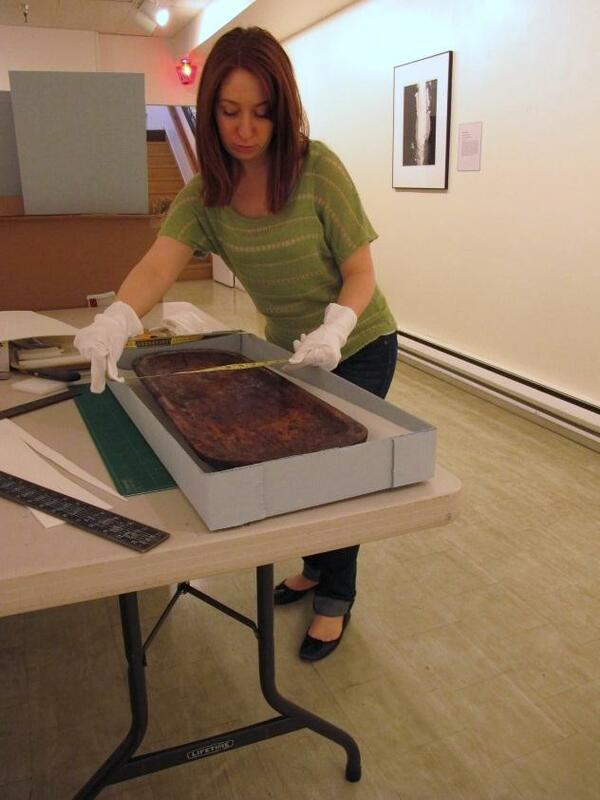 In October 2013, Collections Intern, Kelly Hutson, began her work with Collections Registrar Julie Farnham and Collections Manager Darian LaTocha. 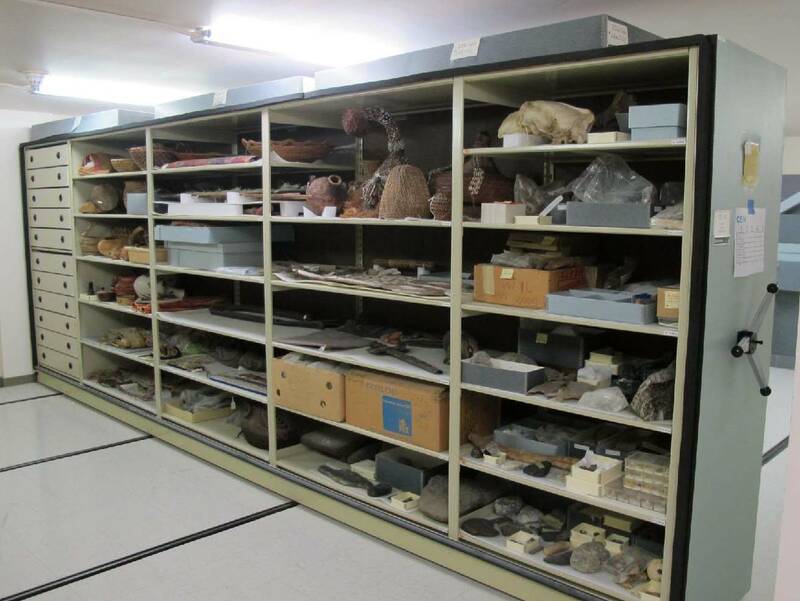 As outlined in their grant proposal, the initial project focused on a small natural history and mineral collection group of approximately 450 objects. 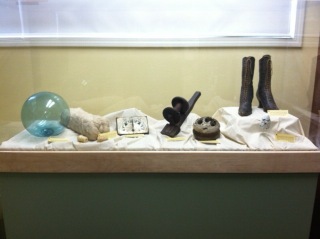 These objects consisted of archaeological and historical bone and wood fragments, minerals, fossils, etc. Originally it was predicted this collection would be completed within two or three weeks and that time spent on this project would be a great introduction for Kelly to handle and process museum objects before moving into the more delicate African collection. Instead this collection turned into a steep learning curve with a wide range of registration and conservation issues. The natural history and mineral collection which was anticipated as a very trivial detail in the overall time line of the grant became a project lasting more than two months. Obstacles encountered with the natural history and mineral collection were a result of limited documentation, inaccessibility, and no photographic documentation. Researching the accession records in attempt to reconcile undocumented and unnumbered objects was a frequent practice. Clearly from the state of the accession files, database records and the objects themselves, the collection was highly neglected for quite some time. Judging from the exhibit history and history of researchers at the Anchorage Museum, it is unlikely that the objects have been reexamined once they were accessioned into the museum’s collection. 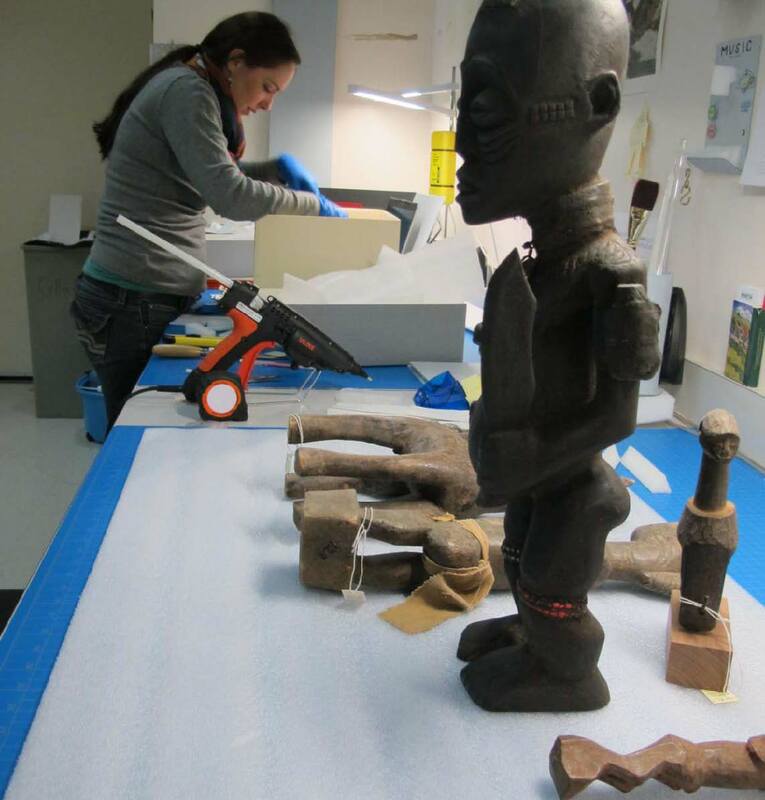 A similar work flow was applied to the next stage of the internship, processing and rehousing the African/Oceanic Collection. As a part of the supply budget for the Grant-In-Aid, four sizes of banker boxes for storing masks, jewelry and figurines were purchased which expedited the rehousing and stacking of the collection groups. 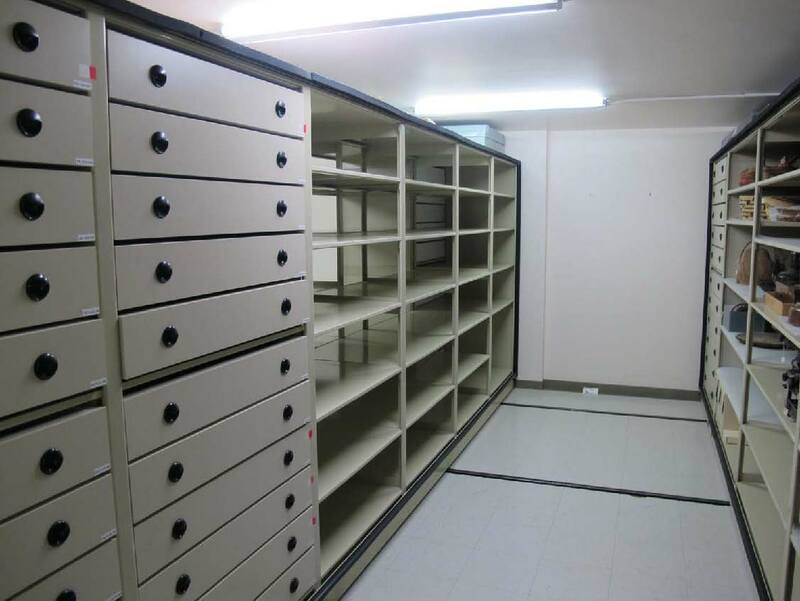 These collections occupied storage space of approximately 520 cubic feet of the compact storage unit prior to the re-housing. Now the same collections occupy less than 290 cubic feet of storage space. This has been a very beneficial project because storage space at the Anchorage Museum is a scarce commodity. A rarity in museums: empty Shelves and newly organized collection taking up less room! Aurora Science Inspires Discovery at Museum of the North. Dates: Key Dates and Deadlines. Propose a session, workshop, keynote, or other presentation here. Submissions are due by Friday, January 30, 2015. Book rooms at the Downtown Washington, DC Renaissance Hotel here. Room rates are $172 plus applicable taxes. Reserve rooms early — the host hotel always fills up quickly. Sign up for the Priority Registration Notification List here. Registration for ATALM conferences fills up quickly. Priority Subscribers receive notice two weeks before registration officially opens. Please note that if you attended ATALM 2014, you are on the Priority List already. Learn more about Washington, DC here. Volunteer for the Conference Planning Council here. Provide guidance for Conference Planners here. Apply for a Scholarship here. Applications are due before May 1, 2015. Submit a Guardian of Culture and Lifeways Award nomination here. Applications are due before July 1, 2015. Contribute to the 2014 Scholarship and Programming Fund here. Exhibit, Advertise or Sponsor an event here . These webinars offer practical ideas for improving collections care at your institution and provide an opportunity for Q&A after the presentation. The Balboa Art Conservation Center welcomes all museum professionals, volunteers, students, and interested people to learn about basic preservation theory and best practices from professional conservators and other experts in the field. The Preventive Care Primer series presents five webinars offered at a reduced introductory price. Our previous webinars have been very well received by a range of attendees, including museum registrars, collection managers, curators, volunteers, and students. 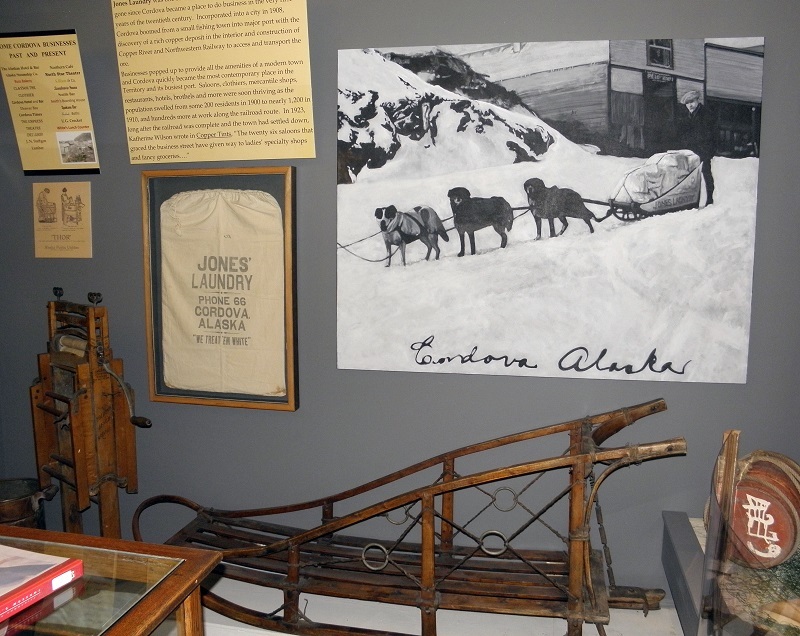 This year was a milestone year for the Alaska State Museum in Juneau. We moved our entire collections (35,000+ objects) into a new storage vault and the old museum building was torn down to make way for the construction of the new State Library, Archives and Museum (SLAM) building. Here are some photos of the demolition of the old building. Question: I have a friend who has a sign her late dad made that she wants to preserve. 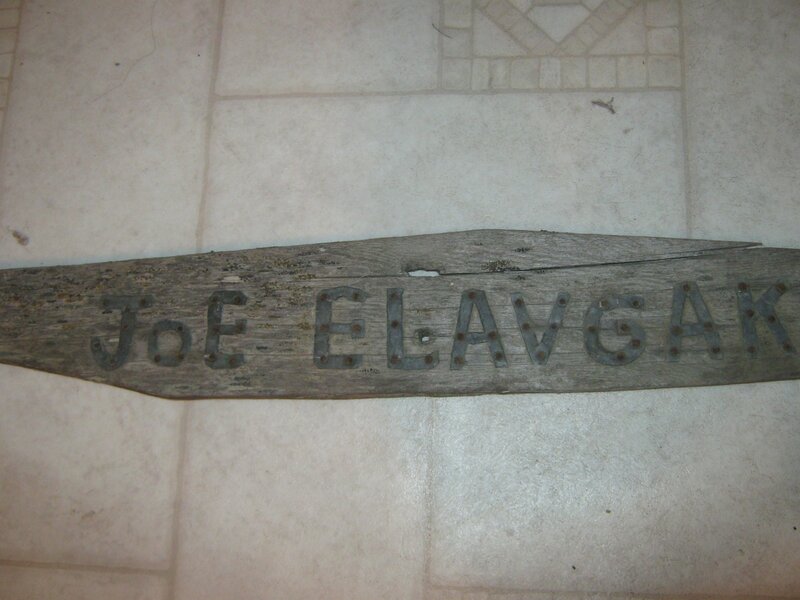 It is made out of wood (milled lumber), with lead letters (hand-cut from sheet lead) nailed on with iron nails. It has a hole where it was hung, and a crack running into that hole. They’d like to rehang it outside, and were wondering what could be done to strengthen it. They were thinking to attach it to a backing and wondering if they could cover it with some kind of clear plastic. Any ideas, suggestions, warnings? ASM: The biggest concern is what kind of weather it will face. Protecting it physically from wind/rain/snow while still allowing it enough sun exposure to dry off would be good. So beneath some sort of roof structure is best. Since this is not considered a museum item but is intended for ongoing use, you could cut a thin piece of wood the exact shape, maybe a little smaller all ’round so as not to be visible, and attach that wood to the back with little brads/tacks/tiny nails that don’t extend to the front to give it some secondary support and take the stress off that big crack. You could cut holes in the support sheet of wood where the current holes are located (maybe a bit bigger so they would not be seen) and continue to hang it in the same style as before. Again the support wood would take off the stress a bit from the old wood. You could use a different material for the support, but keep in mind that wood likes to contract and expand with changing weather, and if you got something too rigid and unforgiving you might cause stress and new cracking in the old wood as it tried to move with changes in humidity. Coatings and plastics and the like are tricky because they often don’t perform well in the long run, yellowing, peeling, etc. Something like a Plexiglas cover will have a certain glare and detract from the look of the sign, as well as get scratched and fogged pretty fast in an outdoor environment. It also has the potential to trap moisture and grow mold. I think if the desire is to put it outside, like near the front door, a supplementary wood support on the back will prolong its life but ongoing deterioration is to be expected. Some other more protected spot, like inside a garage or protected from the weather under a roof but still in an unheated space would be best. And of course you should not do anything to clean it, maybe at the most dust it with a dry soft paintbrush. It has a gorgeous surface and patina. Since its last remodel in 2008, the Seldovia Museum has had a largely static set of exhibits, caused by a combination of factors: a shortage of cases, a small collection, and a lack of funds to create new exhibits. In 2013 and early 2014, the Seldovia Museum obtained four new cases through donations and grants. 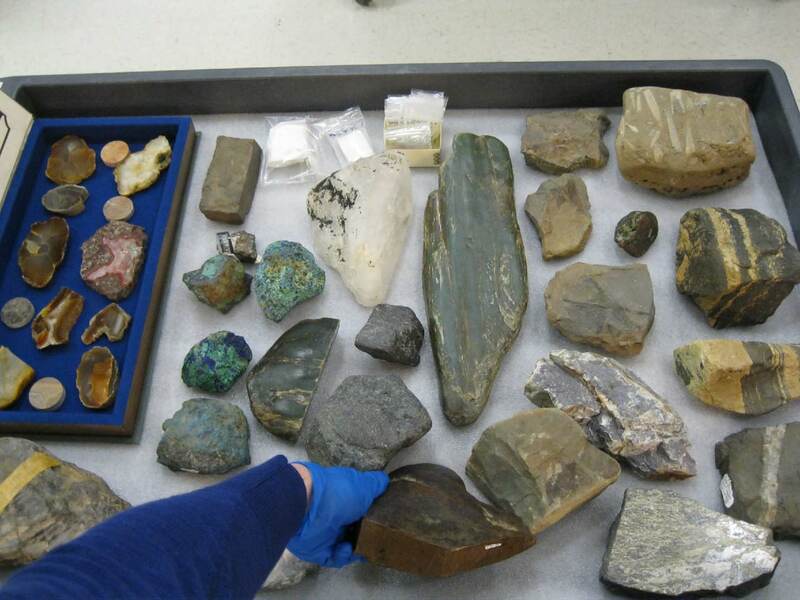 The Alaska State Museums Grant in Aid mini-grant allowed the museum to purchase the materials, supplies and tools needed to put these cases into service. Although the bulk of our visitorship comes from outside the community, increasing the number of Seldovians involved with the museum is an ongoing goal. Being able to mount new and changing exhibits is an important step in attaining this goal. Items purchased with this grant included basic museum-grade materials, such as ethafoam planks, E-flute and B-flute board, acrylic risers, and unbleached muslin fabric that can be used to easily make a variety of basic mounts and supports for museum objects. Materials for welded specialty mounts, including brass rod, brass mount blanks, solder, flux paste and MAAP gas were also purchased. 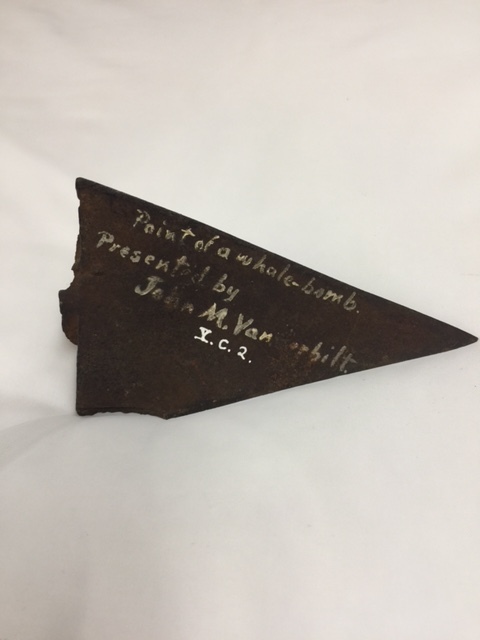 Along with those materials, the museum purchased tools such as ethafoam knives, a brazing torch, copper tongs, a third-hand tool and a hot glue gun with ethylene vinyl acetate hot glue sticks. Having an array of exhibit “support” materials readily on hand has allowed the freedom to create small exhibits without having to seek additional funding. This summer I was incredibly fortunate to have had the opportunity to work at the Simon Paneak Memorial Museum in Anaktuvuk Pass, Alaska. It is hard to put into words how this experience has affected me personally so I will begin with what is easy to discuss—my job. 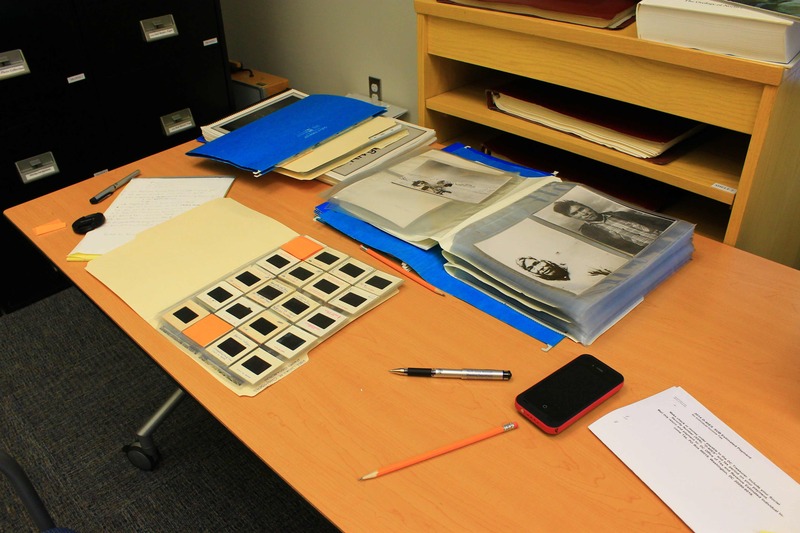 My primary responsibility over the past eight weeks was to organize, digitize and catalog the museum’s collection of photographic prints, slides, negatives, and contact sheets, which comprise a rich visual archive of moments, experiences, events, and people in Nunamiut history. 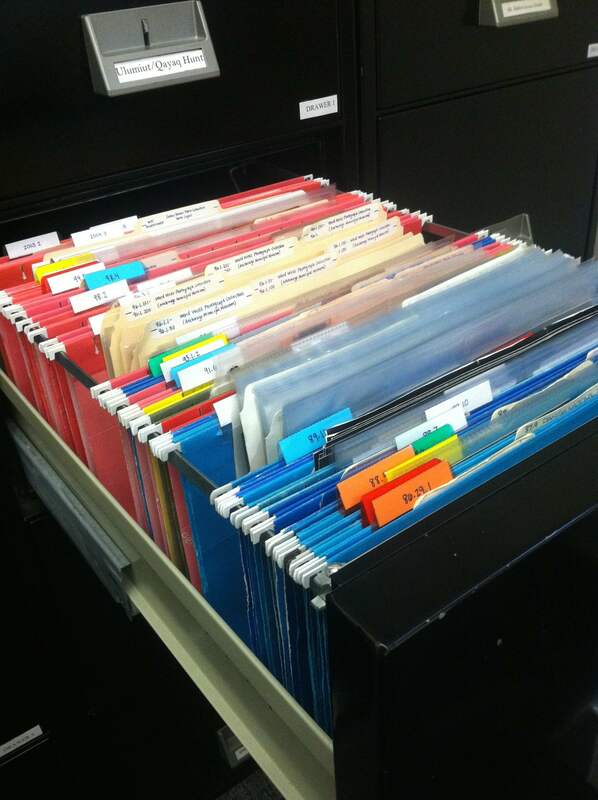 On June 16, I started with two file drawers. One was filled with the photograph collection in disarray. The second drawer was empty. I started with the accessions that were fairly well organized and moved on from there. As in every museum collection, there were issues that needed to be resolved such as multiple assigned accession numbers and for the umpteenth time I was reminded just how important documentation trails could be. This project was an inadvertent but invaluable learning experience for me. In the process of cataloguing images I paired names to faces (both past and present), began to understand the centrality of the caribou to the nomadic life of the Nunamiut, painted a general picture of the surrounding landscape and came to the realization that nostalgia for the past is universal. My research into provenance issues taught me about the donors, their lives and their connections to the Nunamiut, which added more definition to the picture that has slowly been coming together in my mind over these past two months. Now, in early August, the first drawer is empty and the second one is beautifully organized with 2,083 items catalogued and digitized. I am proud of my work with this collection because I know firstly, that it will be more accessible and useful now that it is organized, and secondly, it will be more valuable to the museum’s constituents in its catalogued state. In addition to this project, I helped Vera Woods, the museum curator, revise and update the museum’s endowment packet, which was created back in 1999. I ran the museum on holidays or when everyone else was on vacation and enjoyed finding out where tourists were from and hearing their travel stories as much as they liked asking me the same things. I assisted Jim Barker while he photographed collection objects and picked his brain about all of my amateur photography questions. He is a gold mine of knowledge and experience and has a clear passion for his work. I also taught Vicky Monahan, the office specialist, the basics of Past Perfect so that she could begin cataloguing the library and I organized all of the accession files. I wasn’t a total museum recluse this summer. My co-workers were both incredibly welcoming, inviting me to (delicious) dinners and hangouts after work. I attended a community meeting and heard NSB Mayor Brower speak, learned how to play snert and talimatak (two very entertaining card games), went hiking, climbed the formidable Soakpak Mountain and took a LOT of pictures. Regardless of the temperamental weather and the persistent mosquitoes, it is breathtakingly beautiful up here. There is so much life and growth despite the harsh climate and discovering this some days made me laugh out loud or rendered me completely speechless. Much of this discovery took place on my runs out on the road away from town, where I would disturb a flock of jaegers or be humbled by the force of the wind and the size of the mountains. 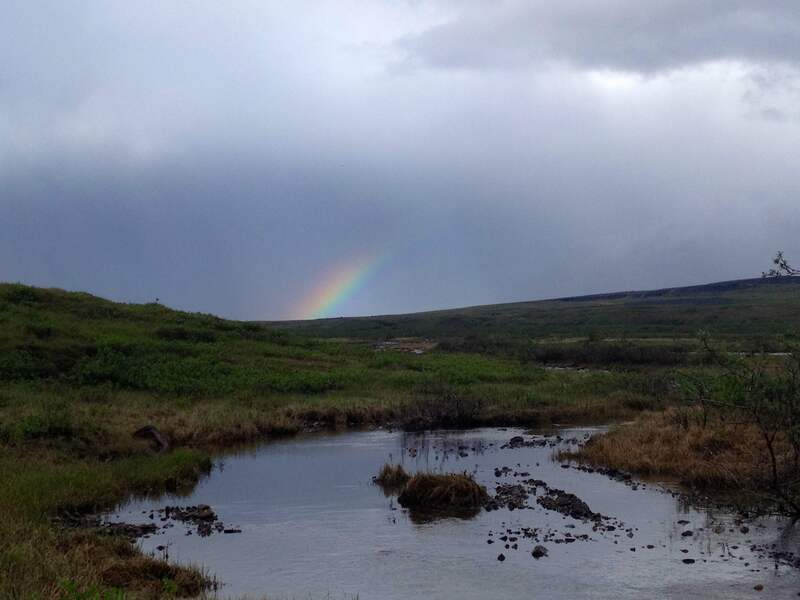 In the summer rainbows are more common than caribou. I don’t think it’s possible to tire of this landscape (although I haven’t lived here in the winter…). I leave here tomorrow morning. It is a bittersweet feeling to know I will probably not be back. I can only hope that my work has made a small impact and the memory of my presence is a positive one. Question: Yesterday we received an interesting proposal to use one of our artifacts and I am writing to ask you for some guidance as I do research on how to respond to him. The request came from a model ship builder and he is interested in recording the tone of a bell that we recently acquired so that his model ships will have an accurate bell sound. His intent is to sell the ships with the authentic sound being a selling point. The gentleman has recording equipment and is ready to go. In the museum world it is not that cut and dry. I am concerned that this will set a bad precedent of using an artifact for commercial use. We do have a research request fee structure but that is for paper and photographs and this would fall outside of it. We do not have a use policy. I am also not clear on how copyright would apply to this situation. This request does not necessarily go against our collections management policy which says that artifact use and care should be consistent with museum best practices. The bell was rung publically by the former director before I started at the museum and that is known to the public. Although it is relatively new to the museum, it is one of our most prized possessions. I don’t want any Joe Schmoe off the street to think they can just come in and ring the bell. So my thought was for the museum to make a recording of the bell and sell it to the man. We would then have it on file in the event we wanted to use it in a future exhibit or if someone else requested it. I am doing research to see how other museums have handled similar situations. Any insight would be greatly appreciated. Thanks! ASM: This is an interesting conundrum. Is it ethical to ring a bell? Is it still a bell if it can never be rung? 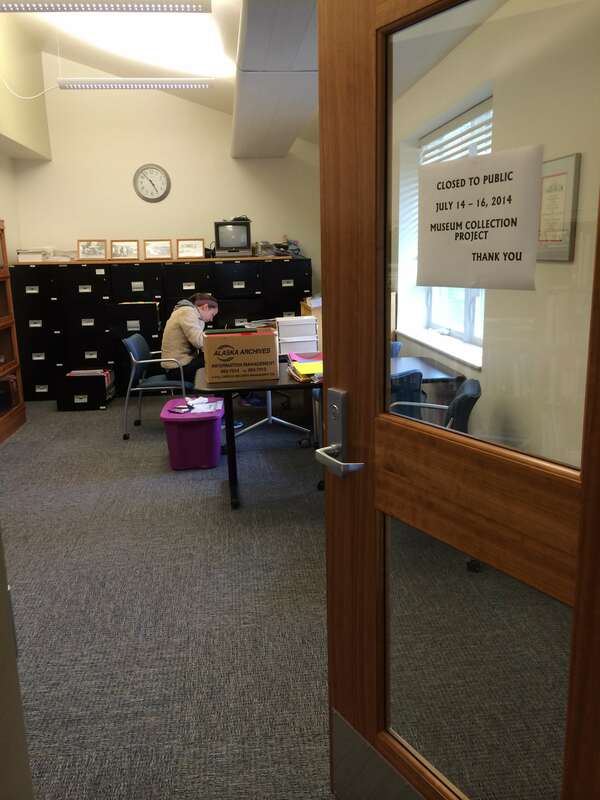 The biggest issue is that ringing the bell does not promote the public good and that is what your collections is for. You are caring for it in lieu of the public, for the public good. That is your public trust duty. In this situation, ringing seems only to promote the model maker’s bottom line. I think if it had some element of broader public good, like a non-profit using the sound for something that helped someone then you could make an argument for it. Ringing a bell does sound innocuous, but it is the wider precedent that it sets that is the real danger. What about an ethical issue of museum pistol being fired so that a toy maker could sell the gun with “The true sound that shot Lincoln!” Most museums would balk at that. Unless the bell is already in a category of consumptive use it would set a bad precedent to ring it for commercial gain. However, there is some latitude for recording the ringing of said bell in order to have it as a part of the information about the bell, i.e. what it sounds like. Kind of like having a recording of a Martin Luther King speech on an LP. You might authorize a one time playing of the record so that it could be digitized. What you do with the digital copy is up to a matter of policy. 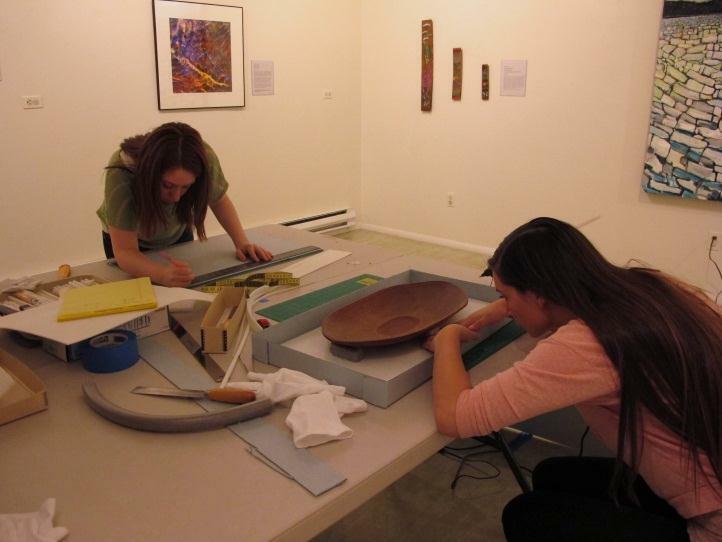 In July 2012, under a project entitled “Teaching the Future to Care for the Past: Mentoring Museum Interns,” the Pratt Museum received funding for collections care supplies, training from a museum professional, and living stipends for two interns. This support allowed the museum to address areas that needed improvement identified in a 1991 CAP survey, including increased time dedicated to collections care and management, and to address priority needs identified in the Pratt Museum’s long-range collections plan. The funding of this grant helped to educate museum student interns and volunteers in areas of collections management, and to develop skills needed to care for specific objects within the museum’s collection. 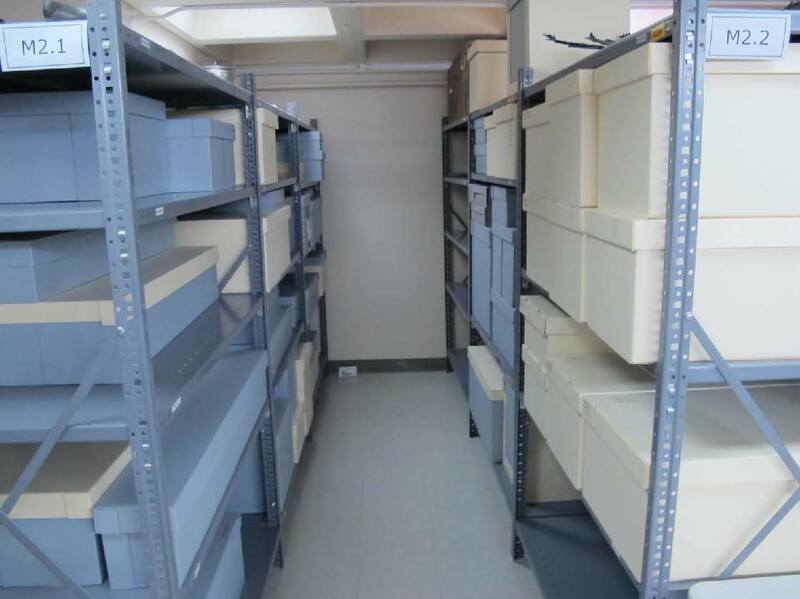 During this project, interns and volunteers carried out inventory tasks, assisted in general collections cleaning, and participated in a collections storage workshop. Under the tutelage of Darian LaTocha, the interns and volunteers learned about collections storage solutions, and were trained to create artifact storage boxes using techniques used by LaTocha at the Anchorage Museum. During LaTocha’s workshop and in subsequent weeks, volunteers and interns were able to rehouse almost 50 at-risk objects in the collection and place them in individual artifact boxes. These artifact boxes create barriers between artifacts and eliminate risks that arise from movement and shifting, providing protection that will help the museum to safely store the collection in perpetuity. This grant allowed the Pratt to support the growth and knowledge of future and current museum professionals. We now have materials and additional trained people who can continue the work of preparing the collections for the move to the new building in a few years as well as long term, safe storage for a variety of objects. Tasks that were performed emphasized the importance of conservation and protection of museum objects so they are not only accessible now, but to future generations as well. Through collaborative efforts from interns and professionals, it is seen that the future of museum collections rests with today’s students. Heritage Preservation is proud to present the remaining three webinars in a series devoted to raising awareness about important emergency management programs offered at the state and federal levels. Ample time is built into each 90-minute webinar for Q&A. Fairbanks, Alaska, Thursday November 20, 2014, 9a.m.-4p.m. Do you want to get a preservation grant to take care of your collections? Many institutions have used grant-funded projects to enhance the level of care they can provide for their collections, and sometimes even to jump start their preservation programs.? “Creating and Funding Preservation Projects to Enhance Collection Care” is a one-day workshop that begins with identifying and setting priorities among collection needs. With a clear sense of needs, the second part of the workshop reviews sources of grant funding available to your institution. The third part of the workshop addresses the key preservation questions asked on grant applications – participants answer the questions on behalf of their institutions, building the elements of a proposal for their own collection. The workshop emphasizes working collaboratively with colleagues to develop and receive feedback on project proposals.? By the end of the workshop day, participants will have:? * Tested their ideas with other workshop participants? Who should attend: Administrators and staff responsible for care of the collection in all types of archives, libraries, and museums, with an emphasis on small-to-medium sized institutions without preservation grant writing experience. By registering for the workshop, the institution commits to supporting the attendee(s) to achieve the workshop’s goals to develop and submit proposals for preservation projects to enhance collection care. When possible, TWO attendees from an institution should attend so they can work together on project development.? Cost: No charge to the institution. WESTPAS is funded in part by the National Endowment for the Humanities.? Additional Information about the workshop will be sent to the registrants before the workshop. A video installation in downtown Lubbock TX.